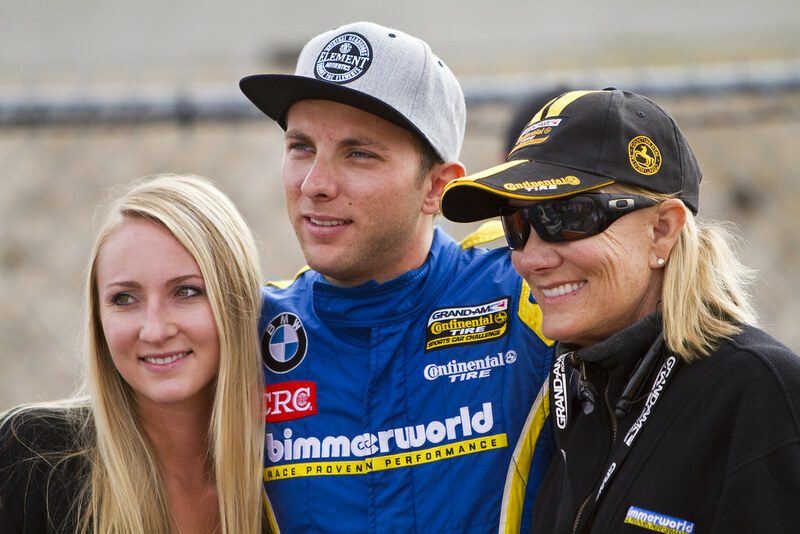 The Continental Tire SportsCar Challenge weekend started right for the BimmerWorld Racing team when team owner/driver James Clay qualified the No. 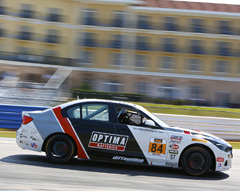 84 OPTIMA Batteries BMW 328i on the pole for the two hour and thirty minute race, Round 3 of the 2016 Continental Tire Challenge series. 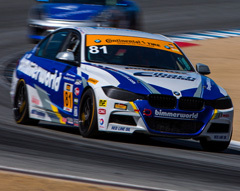 This was the second pole for the Virginia-based BMW aftermarket and tuning specialists’ team with their relatively new F30 chassis. 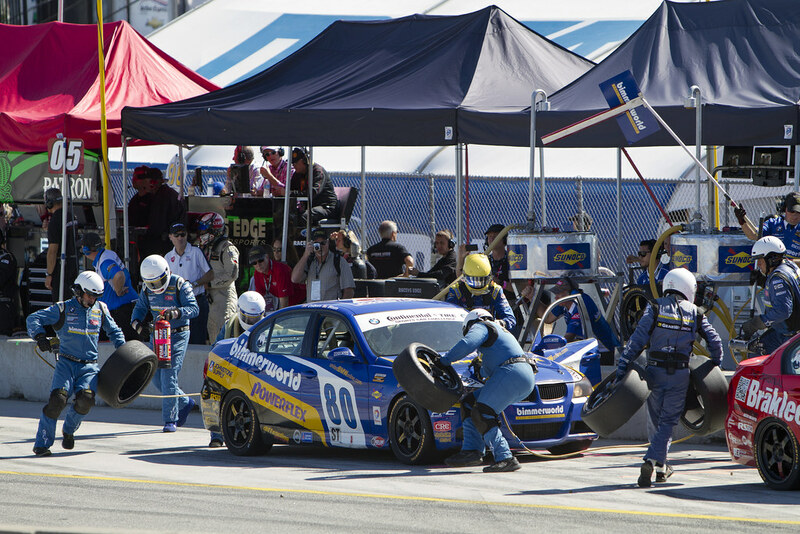 Teammate Tyler Cooke collected a pole at Sebring International Raceway in March. 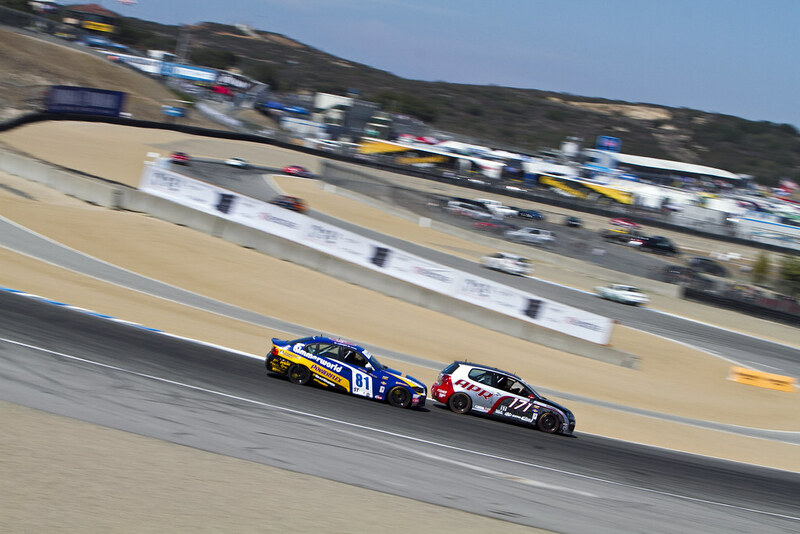 Clay and Cooke drove a strong and lively race, where they stayed in the Top 5 the entire race other than when they pitted for a driver change, tires, and fuel. 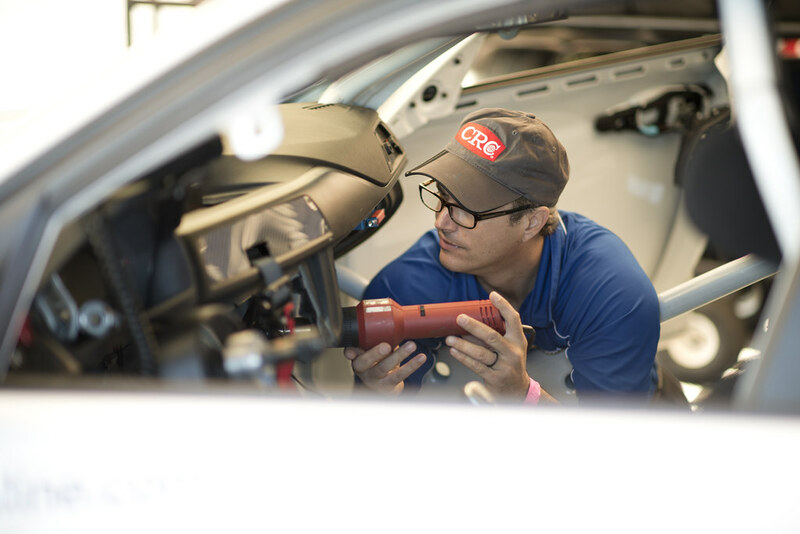 Even with Clay having a touch of the flu, he drove smart and delivered a fast car to Cooke. 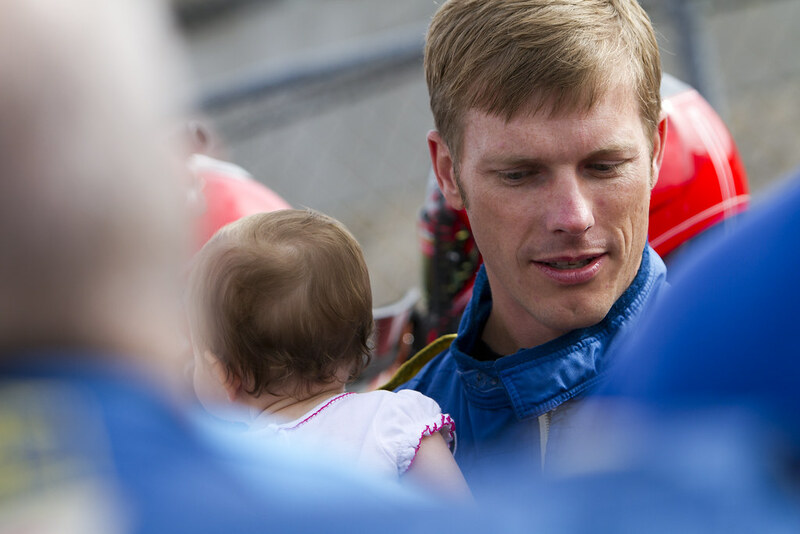 Despite a spirited on-track battle, Cooke brought home the No. 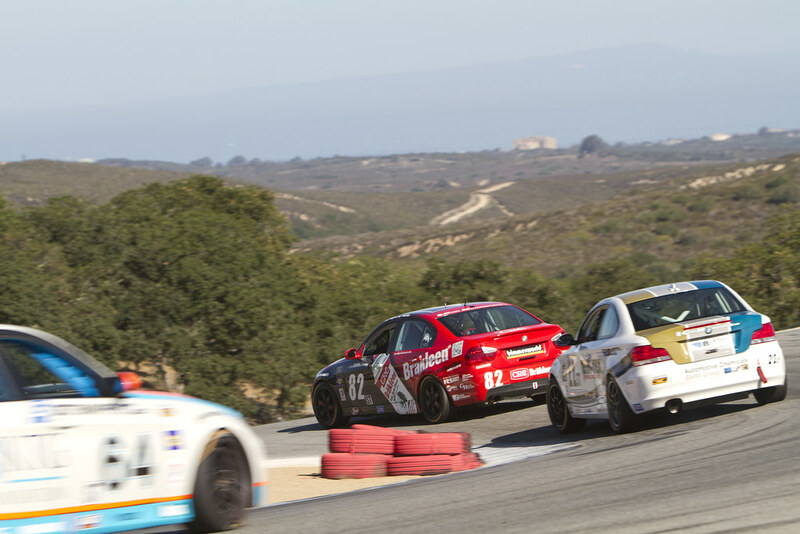 84 F30 in fourth place in class. The results of the No. 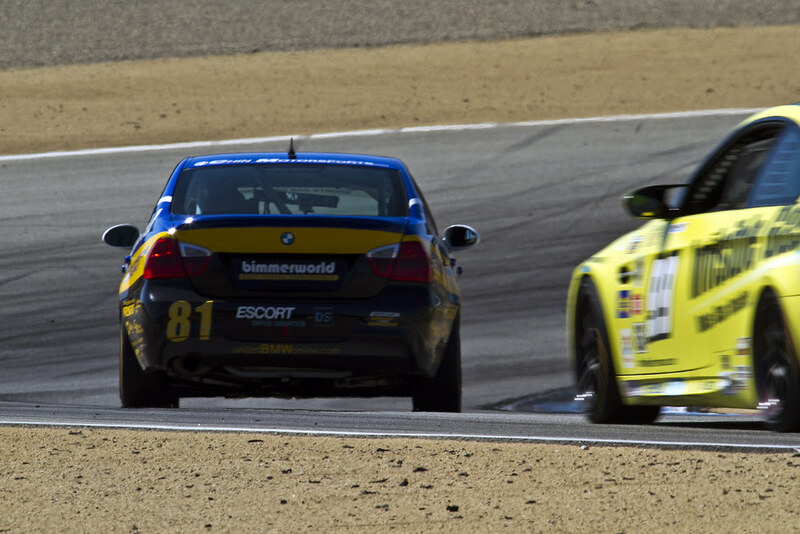 81 BimmerWorld BMW 328i of Jerry Kauffman and Kyle Tilley with 20th place in the ST class did not show the strength of the car at the start of yesterday’s race, and contact with another car during the race provided challenges that caused Tilley to have to preserve the car to finish and get needed points towards the 2016 championship. 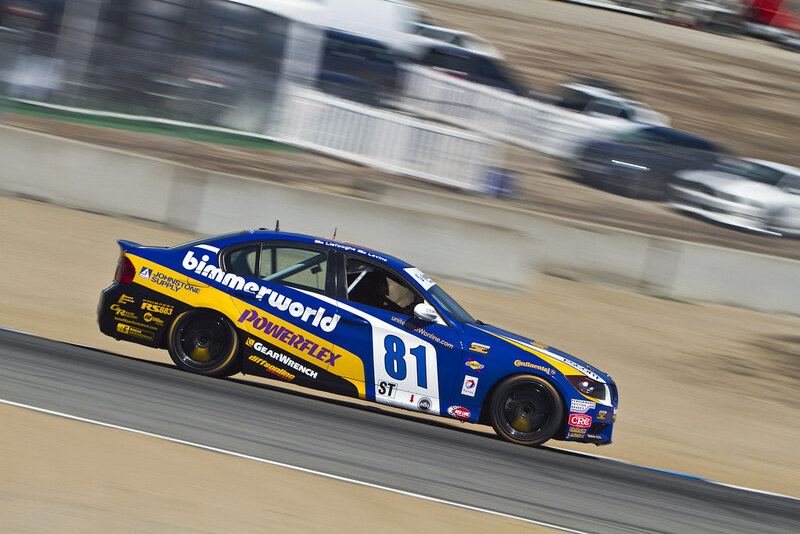 The BimmerWorld Racing team is ready to return to the 2.24-mile, 11-turn Mazda Raceway Laguna Seca circuit this weekend for Round Three of the IMSA Continental Tire Series’ Continental Challenge race with their turbocharged BMW 328i racecars. 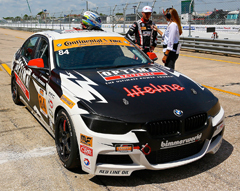 The BMW aftermarket and tuning specialists at BimmerWorld celebrated their first podium finish with the new F30 chassis at Round Two at Sebring International Raceway in March when the No. 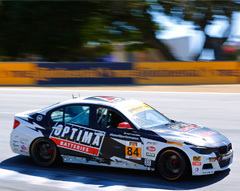 84 OPTIMA Batteries entry of James Clay and Tyler Cooke grabbed both the pole and third-place finish in a hard fought battle. 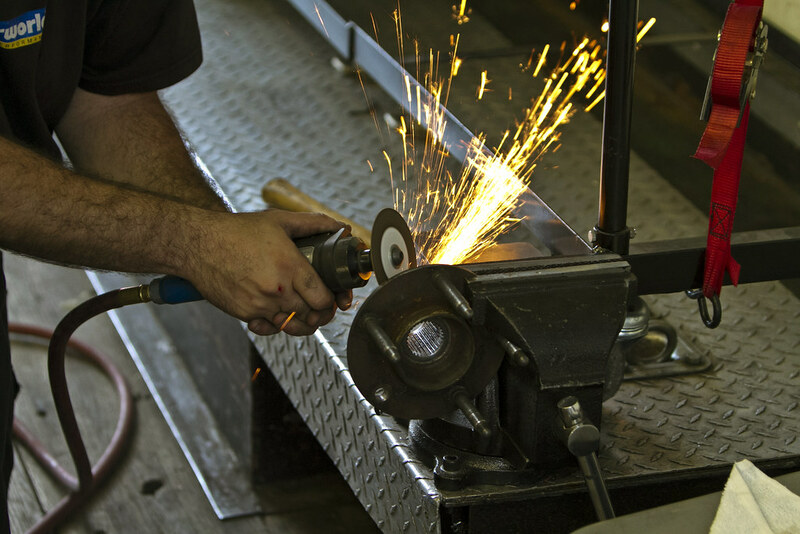 The Dublin, Virginia-based team also fields the No. 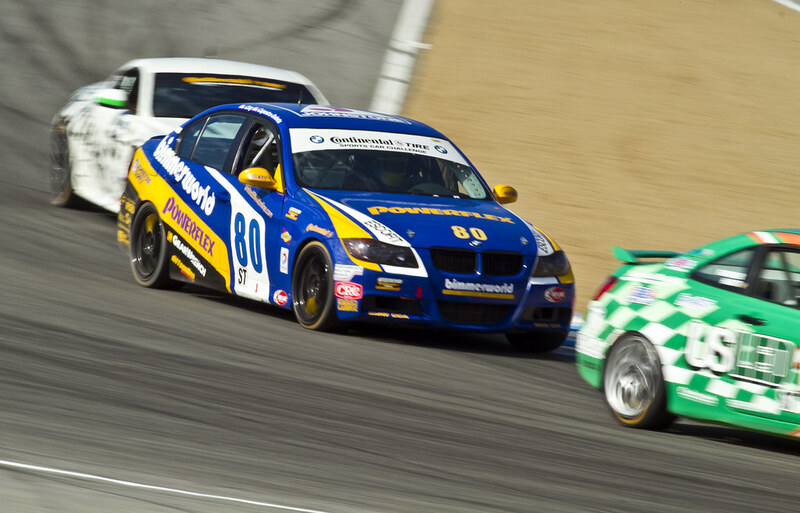 81 BimmerWorld BMW 328 of Jerry Kaufman and Kyle Tilley, which has not yet had the success from the speed shown on track. 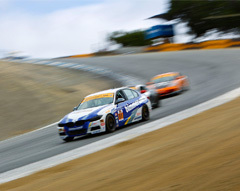 They plan to come to the Monterey Peninsula with a car displaying even further advancement in the development of the F30 platform for the 2-hour and 30-minute race. 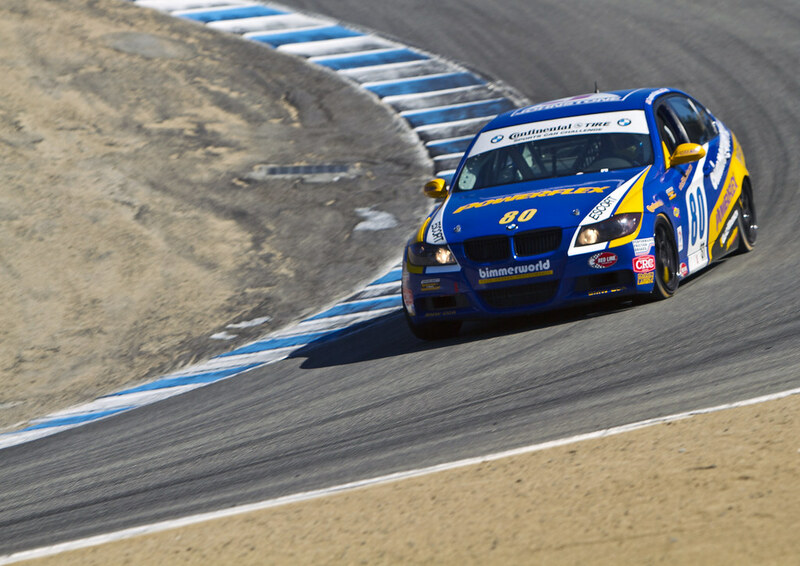 How well suited do you feel the BMW 328i (F30) is for the Laguna Seca circuit? 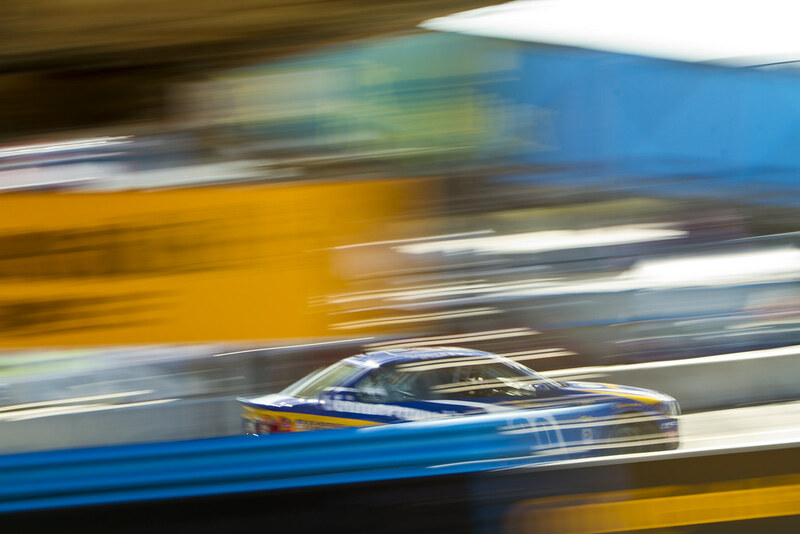 Coming off of the first ever podium for the 4-cylinder turbo BMW F30 at Sebring, does that add pressure going into Round 3 of the season at Laguna? 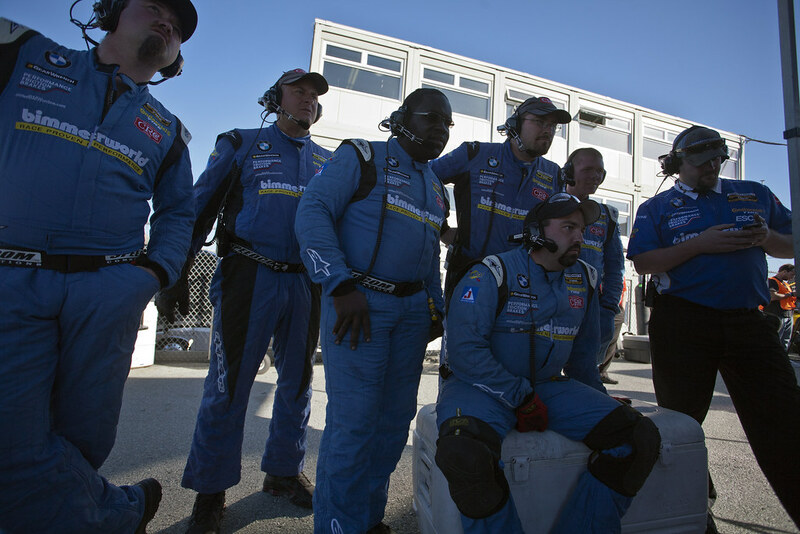 Your BimmerWorld crew really showed their mettle at Sebring when you had to do an engine change before the race. 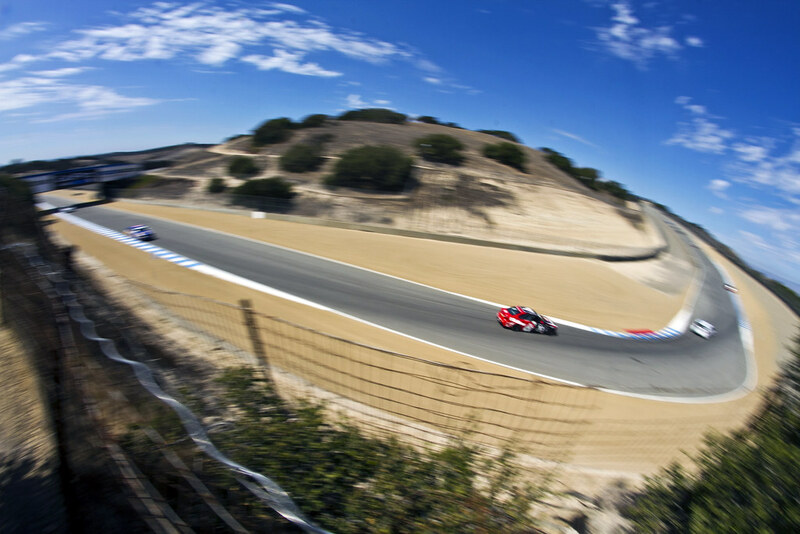 Now that there has been a long break since March, what has the crew been working on to prep for Laguna and beyond? 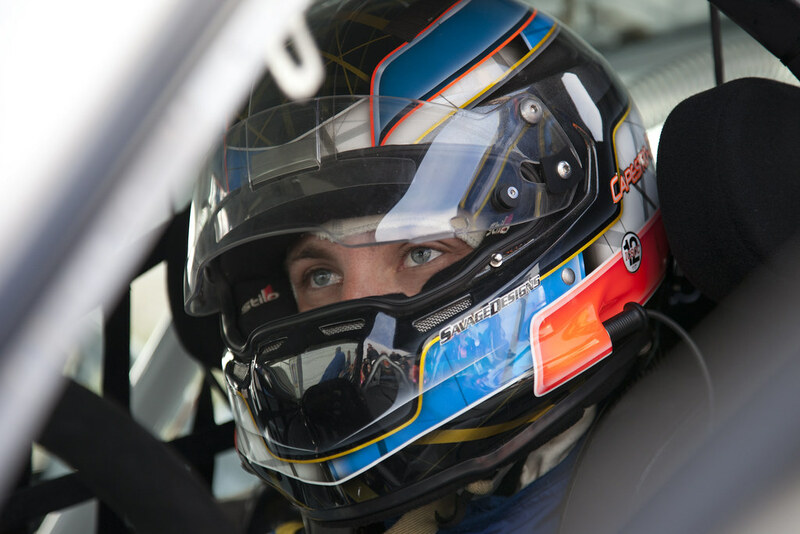 You earned your first professional pole at Sebring but had to start from the back after an engine change, yet finished on the podium in a hard-fought battle. 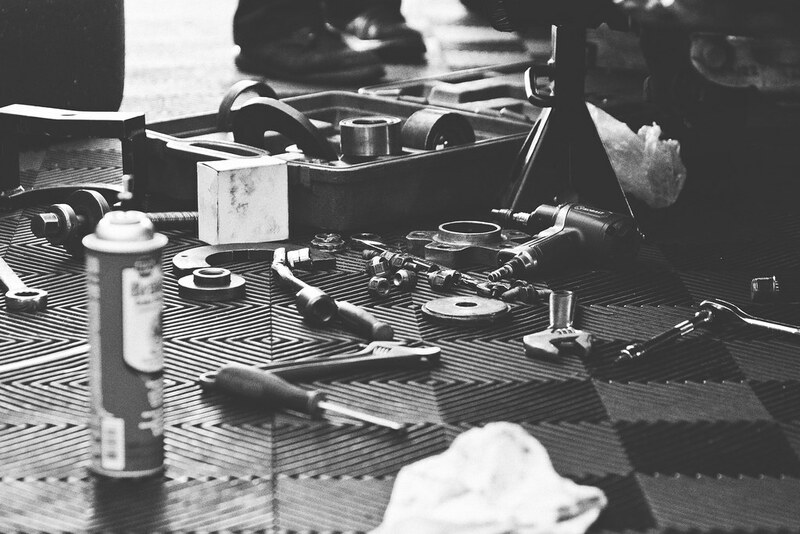 Do you feel that experience has prepared you for anything this year? 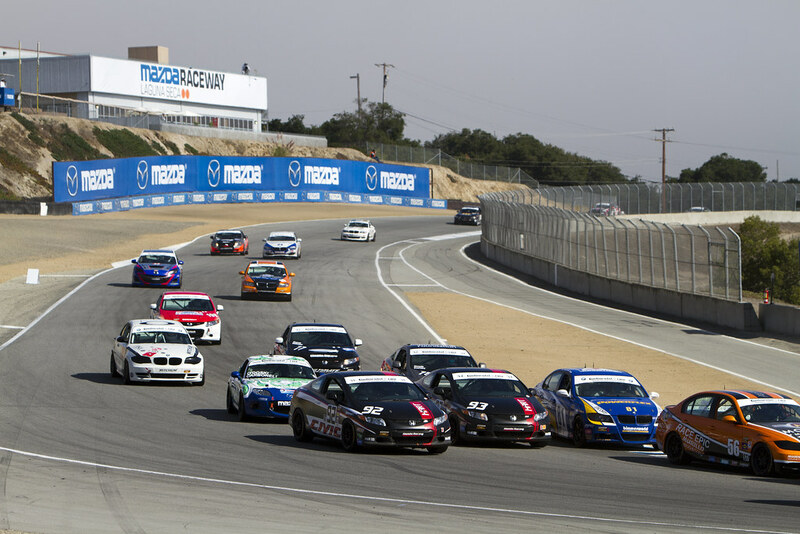 You’ve been racing the BMW F30s for a couple of year now. What impresses you about it most? 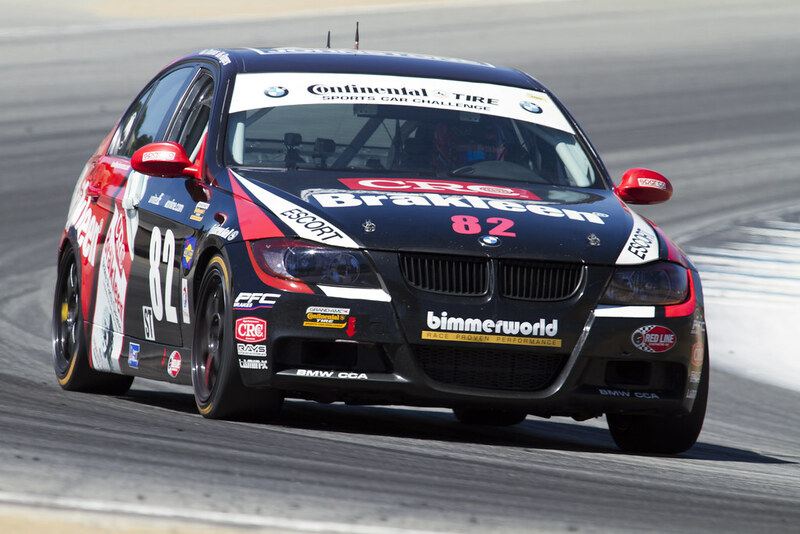 How have you seen the BimmerWorld crew advance this car in IMSA Continental Tire competition? 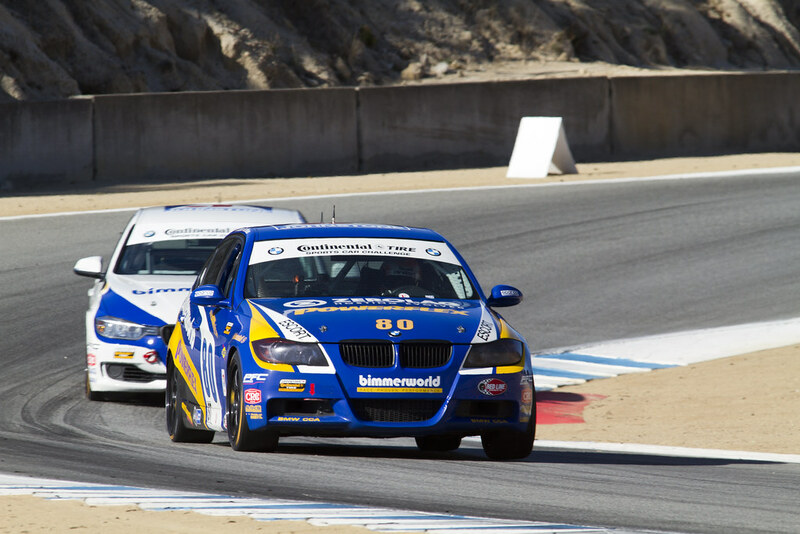 How well suited you think the BMW 328i (F30) is for the Laguna Seca circuit? And what’s your favorite part of the track and why? 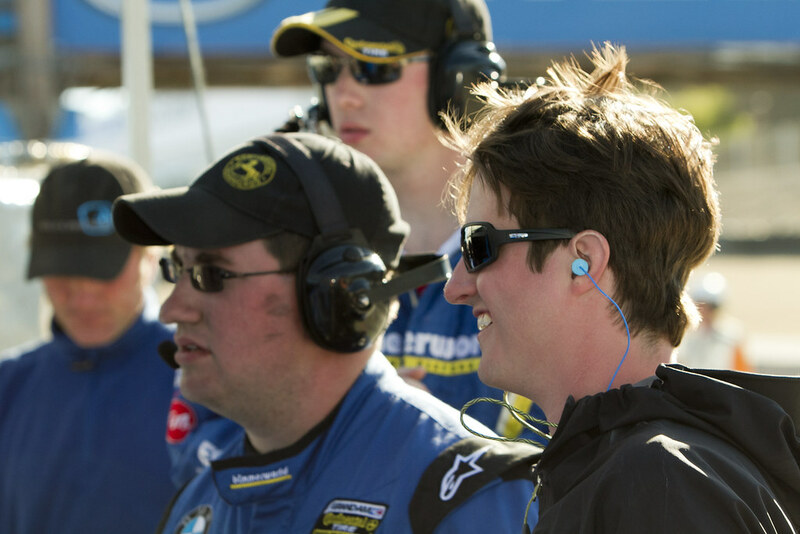 You are a driver coach and your teammate is a rookie in the Continental Tire Series; do you spend much time serving as a coach and mentor as well as co-driver? 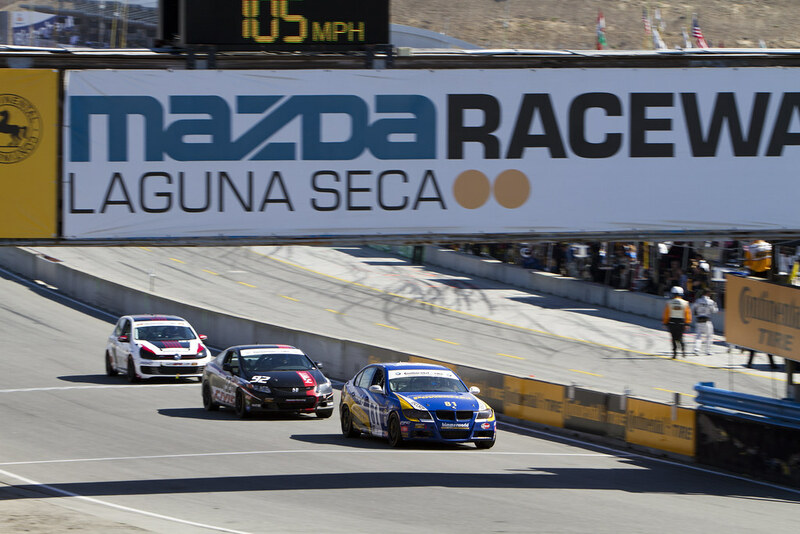 As a rookie, this will be your first time racing at Laguna Seca. What have you heard about it and what are you looking forward to the most? 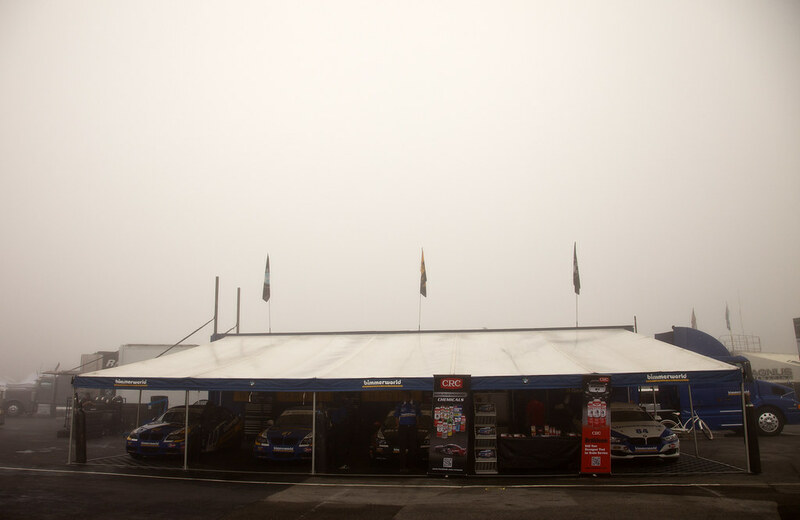 You had a good qualifying run at Sebring. How do you prepare for qualifying when these are new tracks to you? 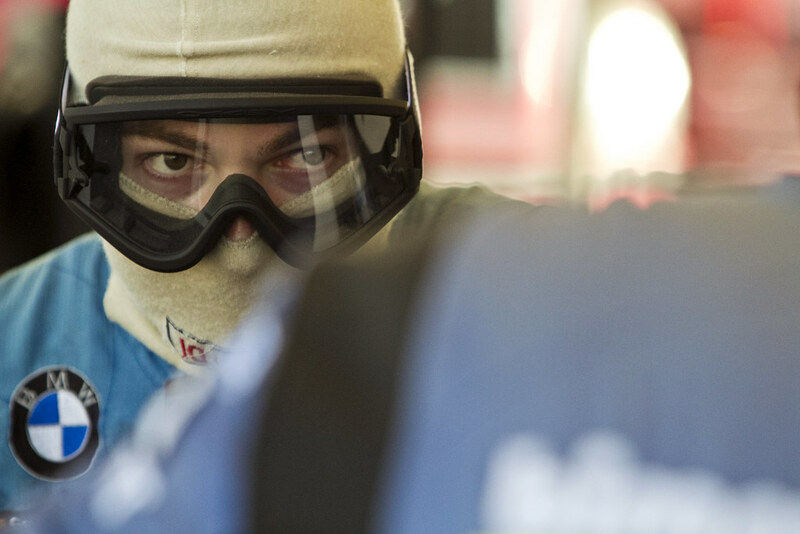 How have you and Kyle gelled as teammates and co-drivers so far this season? 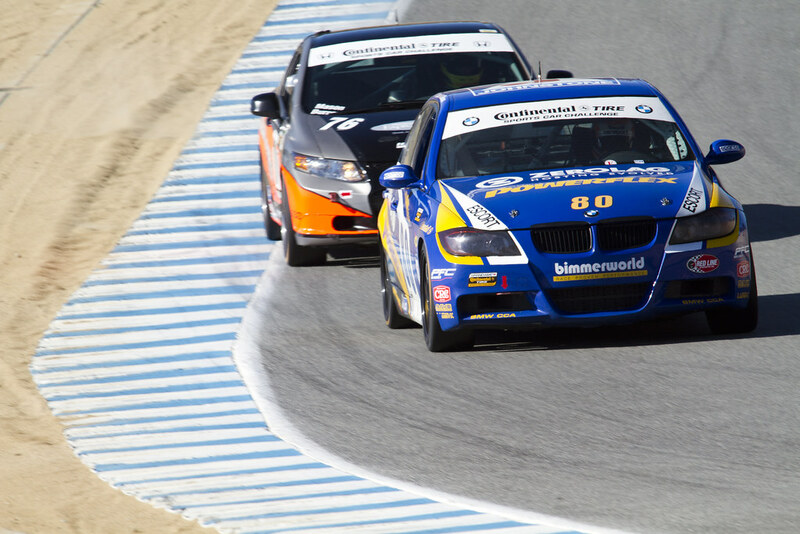 By all accounts, the BMW aftermarket and tuning experts at BimmerWorld had a wildly successful trip to Mazda Raceway Laguna Seca. 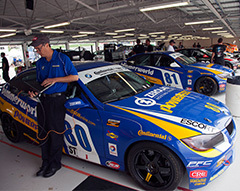 The team’s turbocharged BMW 328i platform was fast in the hands of the drivers who pilot the Nos. 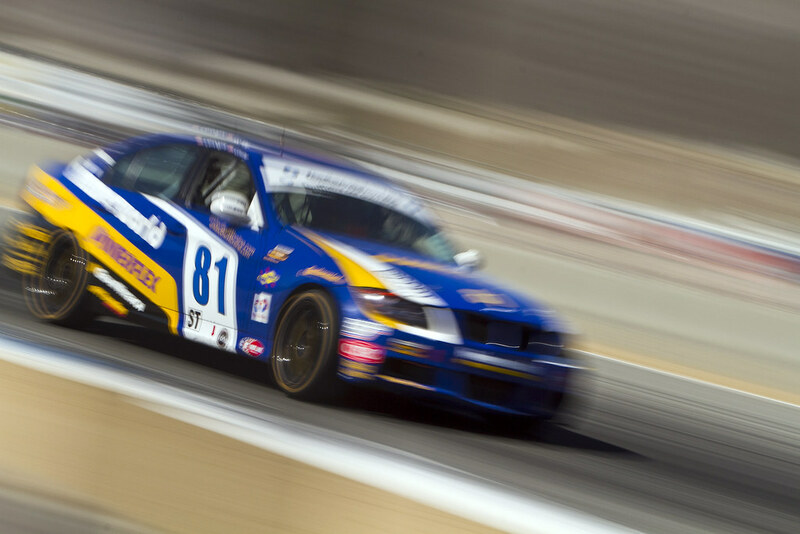 81 and 84 entries, and with local driver Andrie Hartanto combining with teammate Tyler Cooke to place sixth in the Street Tuner class with the 81, it almost felt like a win for the veteran program. 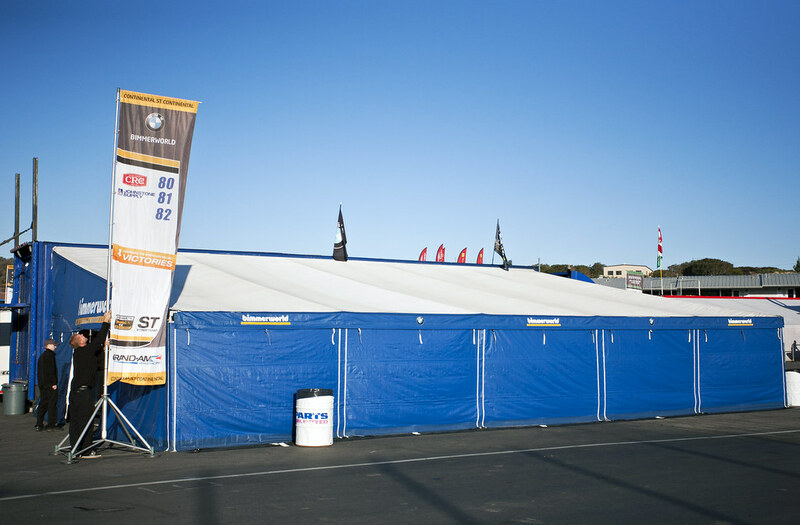 Based on the vast performance inequity between normal-size cars like BimmerWorld’s BMWs and the miniscule cars that have dominated the ST class at the event for five years running, it was hardly a surprise to see the smallest, lightest machines in the field capture the top four positions in the race. 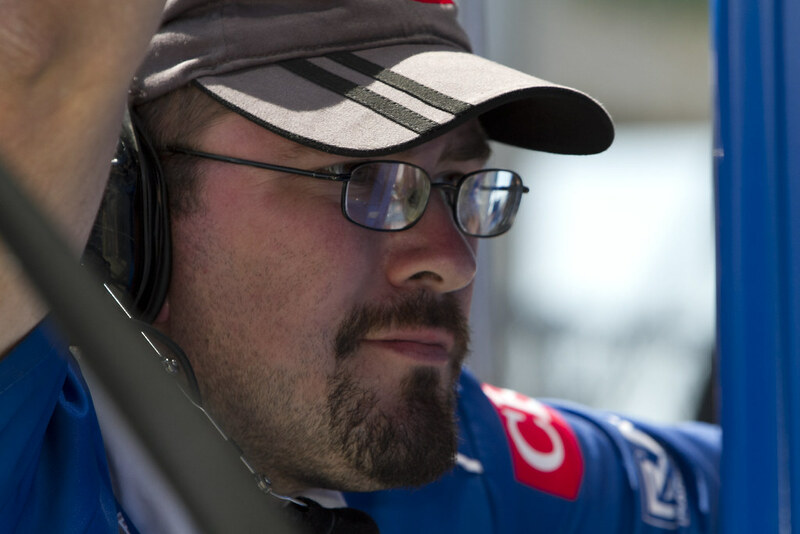 Resigned to a best-in-normal-class outcome, team owner/driver James Clay was realistic in his expectations where finishing sixth was akin to earning second, albeit without the extra Championship points. 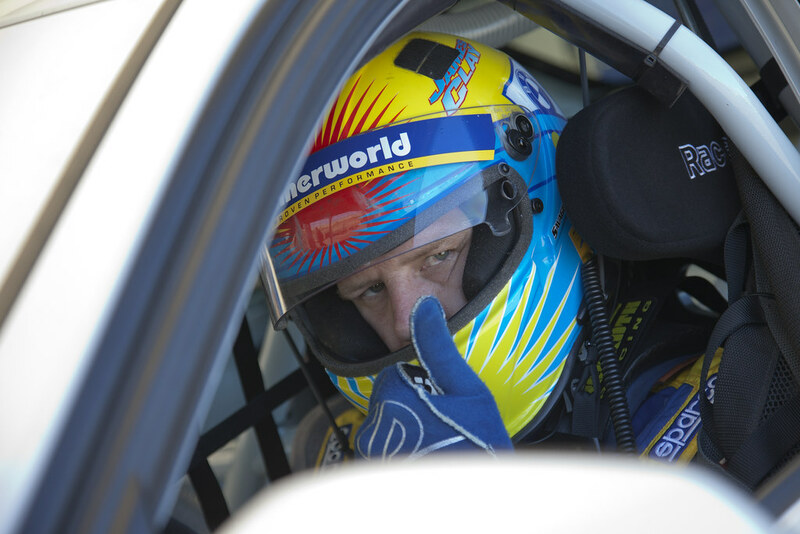 Even with the bad luck that left Clay and co-driver Jason Briedis in 23rd at the end of the race in the No. 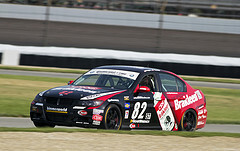 84 OPTIMA BMW 328i, Clay was pleased with the performance from Hartanto and the impressive effort by Cooke. 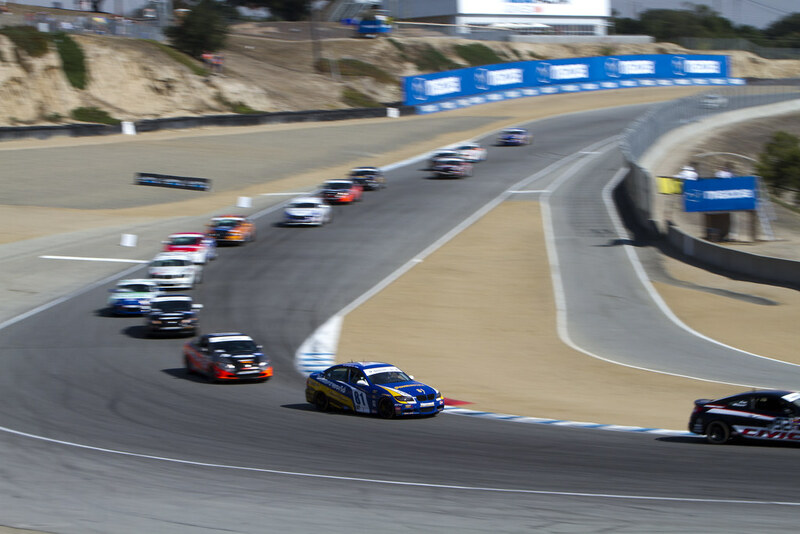 For Hartanto, who is in the midst of a solid rookie season in the Continental Tire Series, Monterey was nothing but a positive event. 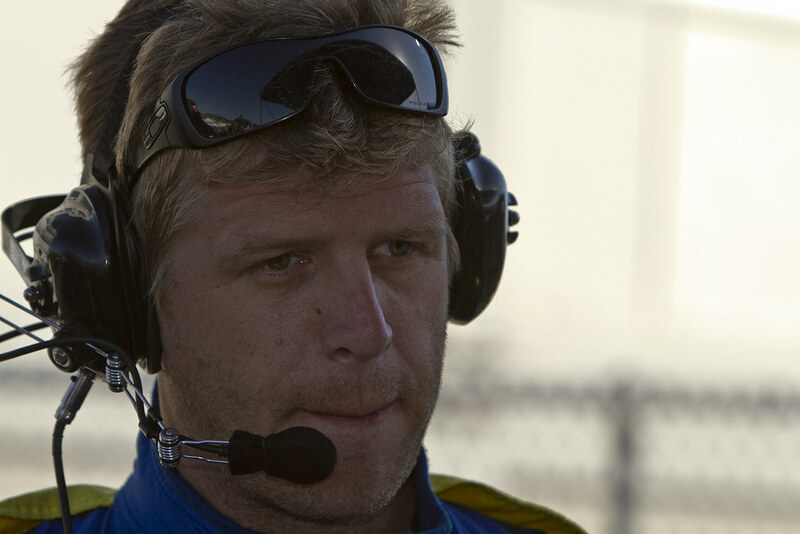 Cooke: The race went very well with the 81 car. 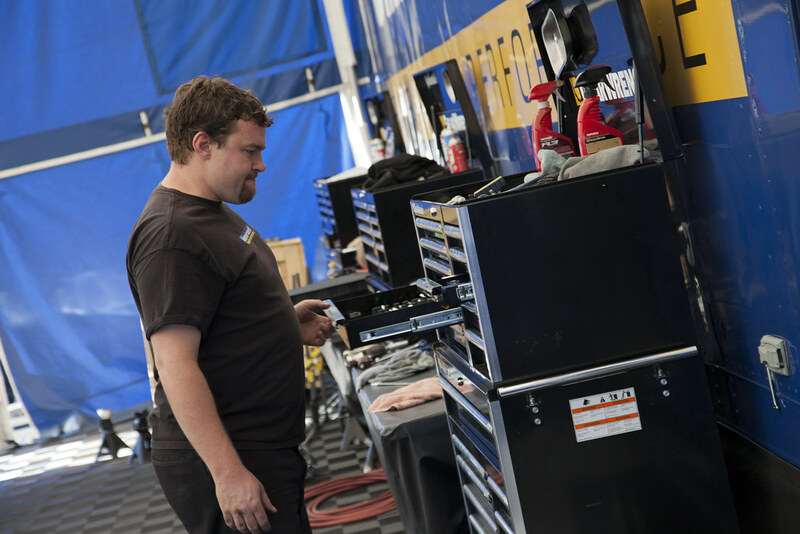 Andrie did a great job bringing the car to fourth and both Jason and Andrie showed great team work by working together bringing the cars into the pits in the top-5. 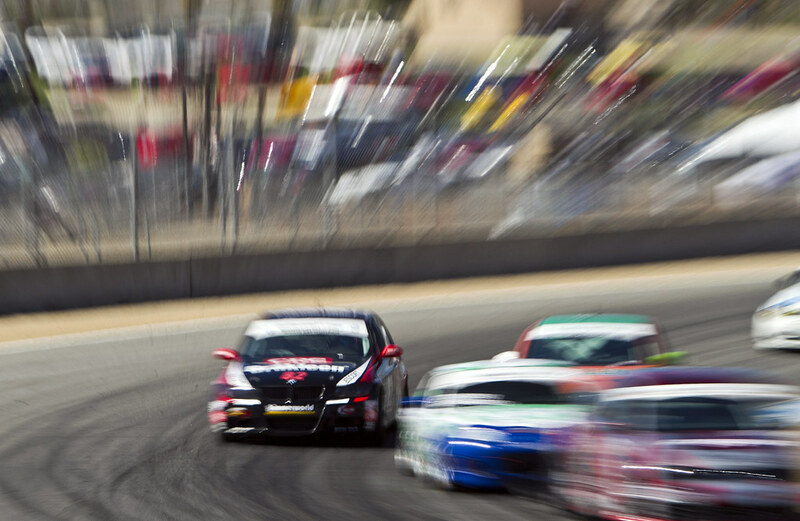 My stint was very good, too; I could run close to the same pace as the leaders but couldn’t get close enough to them. 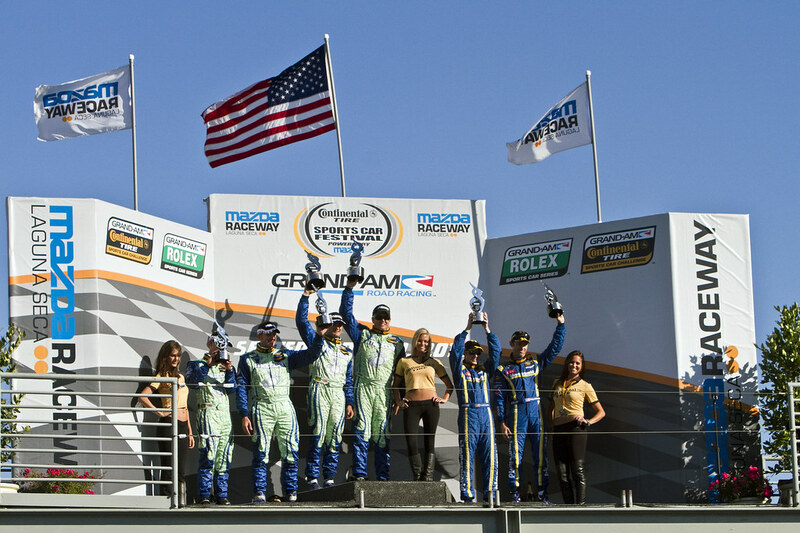 All things considered, this was a great race for us and the team moving into Watkins. Hartanto: My disappointment with qualifying was dampened by learning that a boost leak impacted our result. It was so exciting to be able to fight our way up the field. 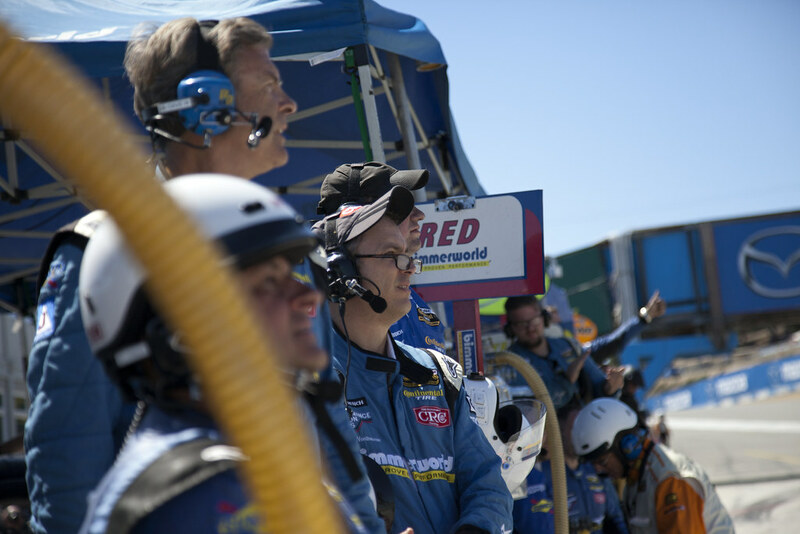 When our engineer radioed that we were leading the race, it was memorable. 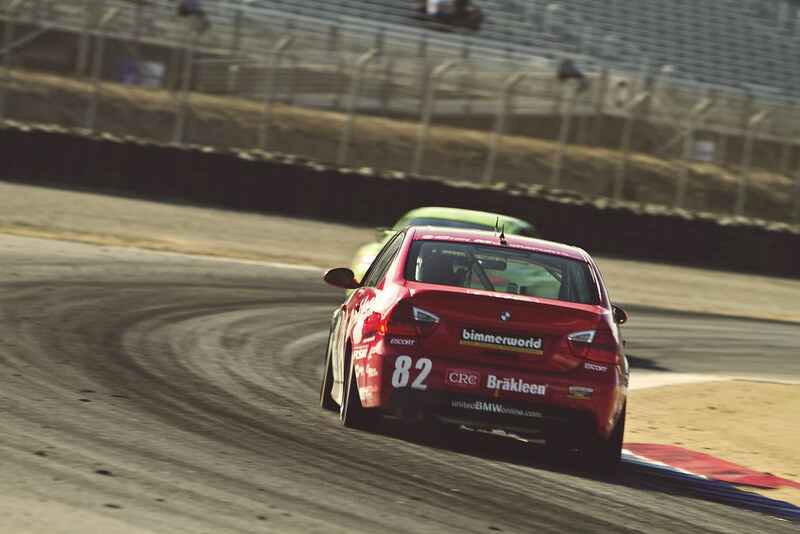 The couple of laps in the lead were awesome. 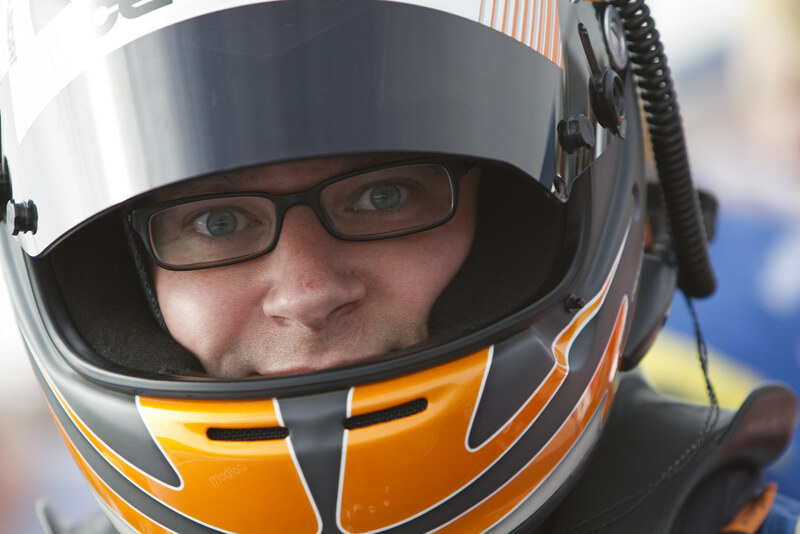 Yes, it may have boiled down to the pit stop timing of the eventual winners, but I’ll never forget hearing our engineer over the radio saying that we had the lead. 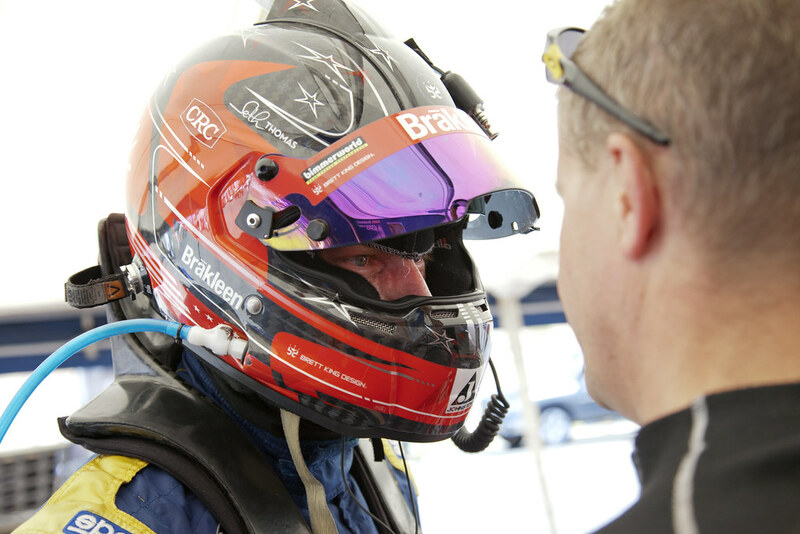 Briedis: We had a solid qualifying starting sixth. 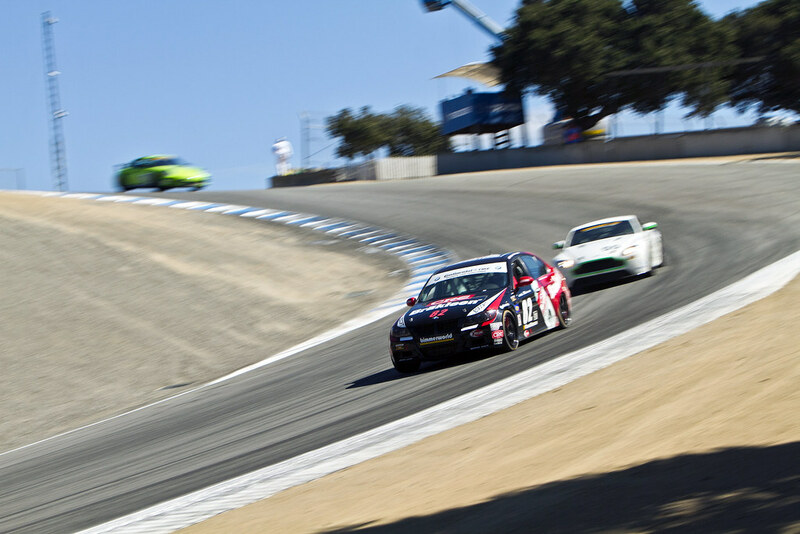 I was able slip into fourth when the Honda and the Porsche got together heading into Turn 6. From there we ran in 4th most of the race. 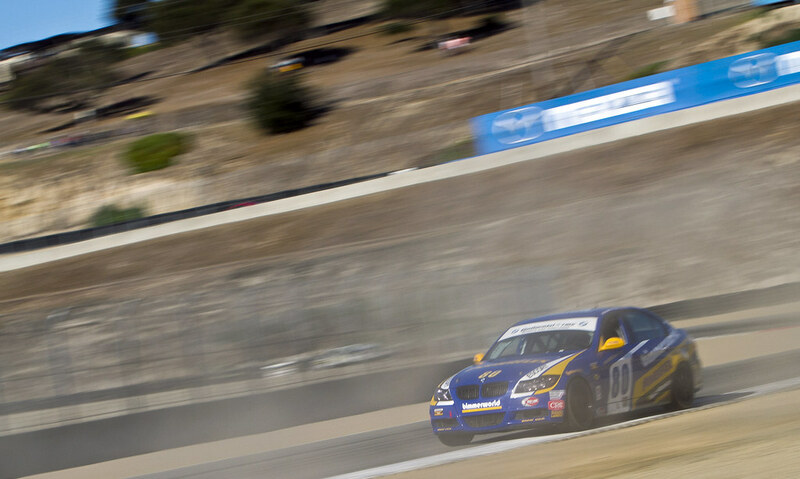 James was on track for a strong finish until the mechanical issue. 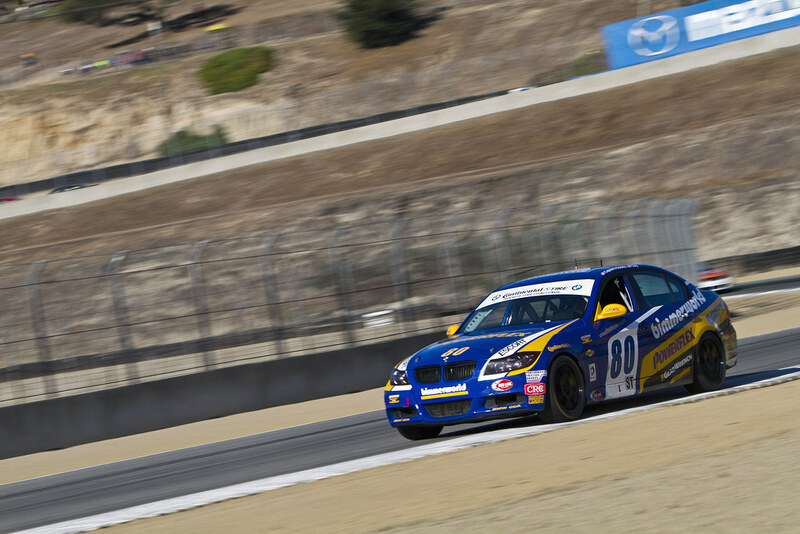 Our car is getting better and better each race and we hope to contend for some wins soon. 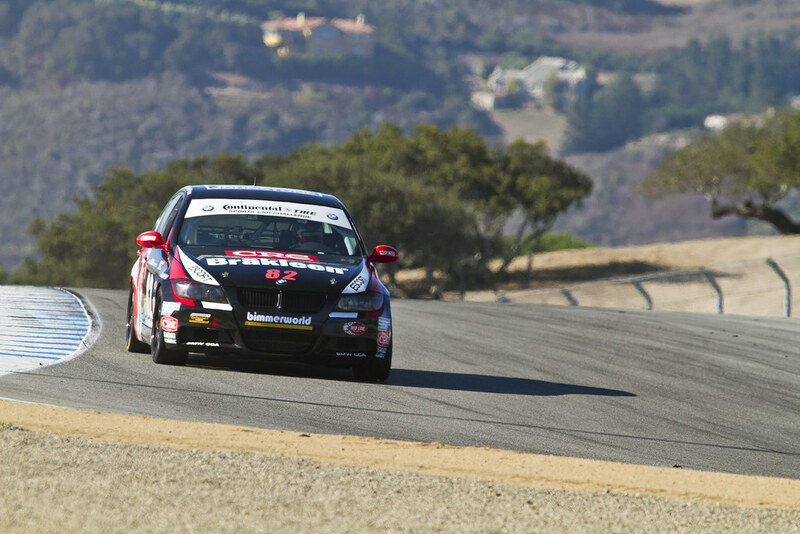 Clay: I have historically done well at Laguna, and Jason and I had a fast car last year. The track really came to us perfectly and we were on our way to another strong result until bad luck stepped in in the form of metal fatigue and left us both wishing it wasn’t seven weeks until Watkins. 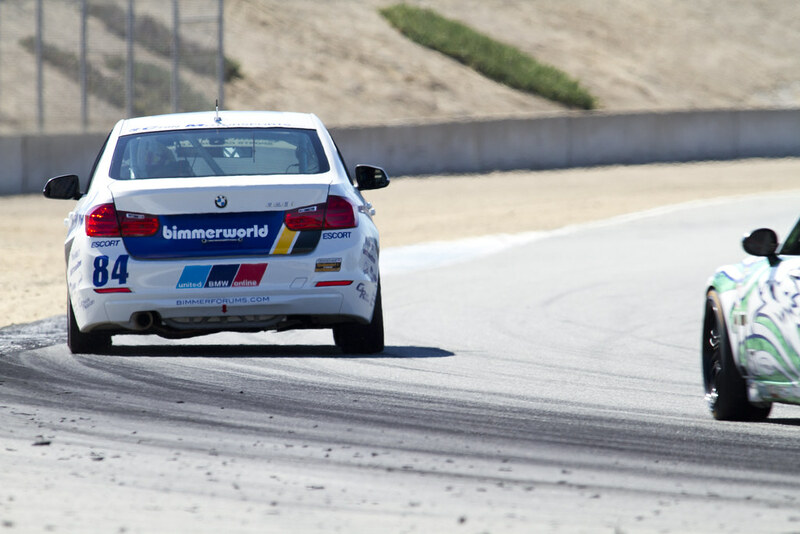 BimmerWorld’s visit to the famed Laguna Seca road course in 2014 revealed the potential of its newest challenger, the turbocharged BMW 328i chassis built on the German brand’s F30 platform. 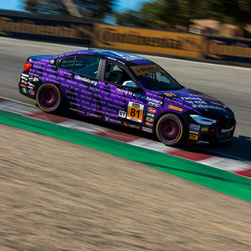 Team owner/driver James Clay and co-driver Jason Briedis were incredibly fast in their brand-new F30, and despite competing while still in the early stages of its development process, the BimmerWorld team left the Californian circuit with a clear picture of what the F30 had to offer. 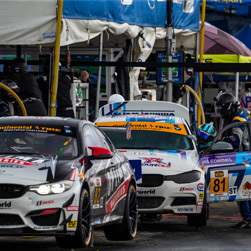 One year later, and with the luxury of a six-week pause since the last race held in Sebring, Florida, BimmerWorld is headed back to the picturesque track located in Monterey with two F30s and a goal of capturing their first victory with the chassis in IMSA’s Continental Tire Series. 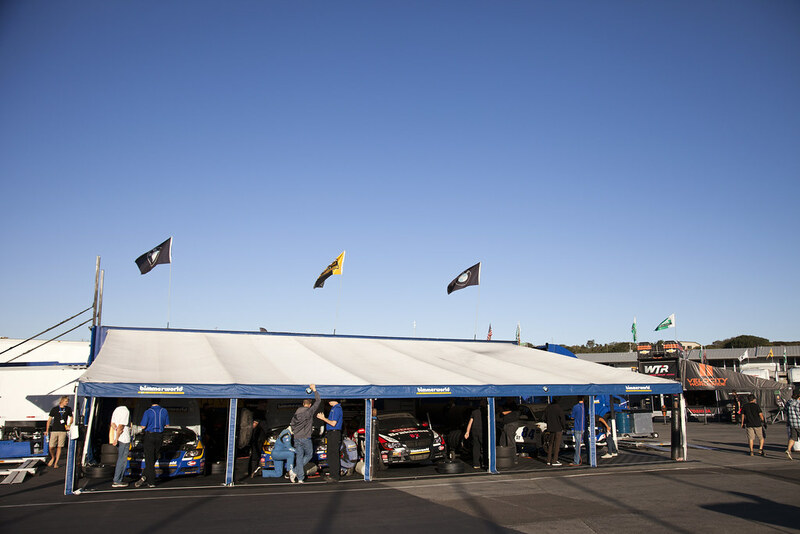 Among the major improvements made since Sebring by the BMW tuning and aftermarket experts, additional cooling gains have been incorporated into both cars. 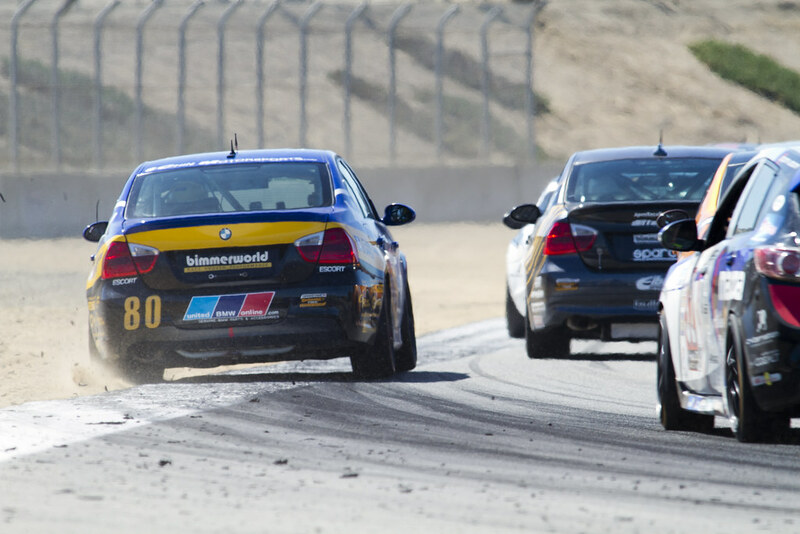 BimmerWorld’s F30s are one of the heavier cars in the field, which is far from optimal at a rolling circuit like Laguna Seca. 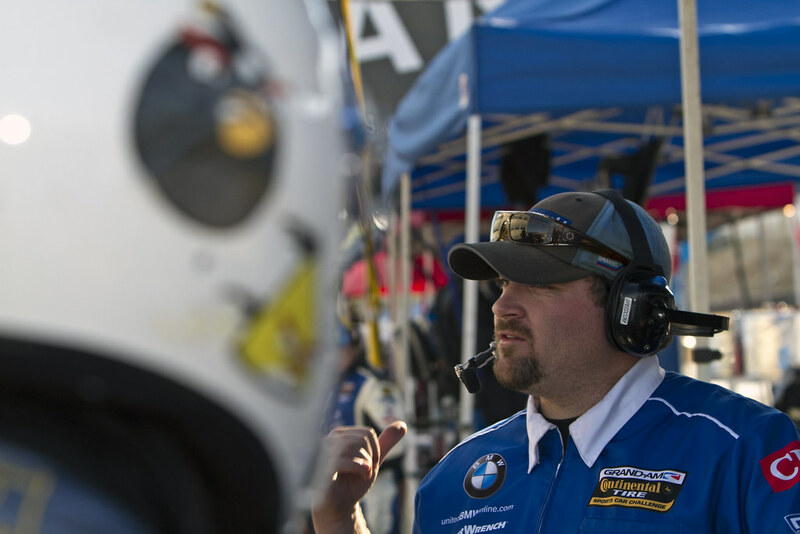 Despite the rules-mandated heft, Clay is confident his BMWs will have something to show against the other entries in the Street Tuner class. 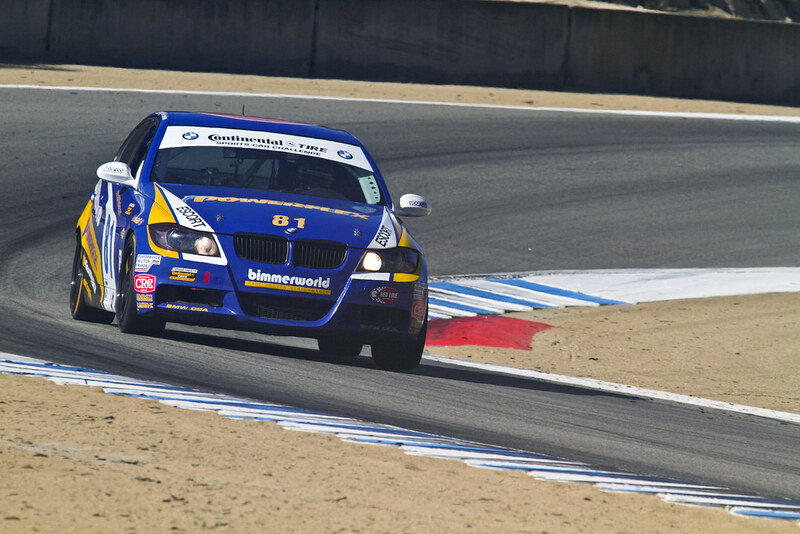 The trip to Monterey is particularly special for BimmerWorld driver Andrie Hartanto, who lives in the San Francisco Bay Area and shares the No. 81 F30 with Tyler Cooke. 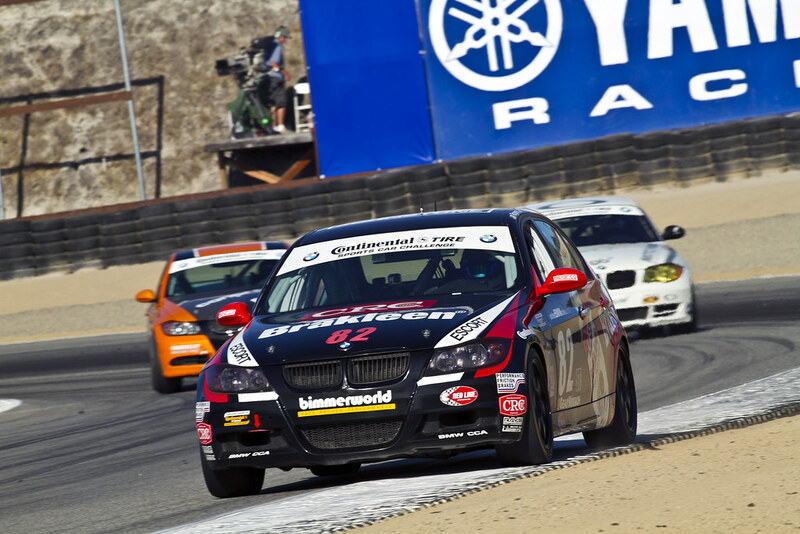 With the comically small cars in the Continental Tire Series running away from the field once again in the Street Tuner class at Mazda Raceway Laguna Seca, the BMW specialists at BimmerWorld turned to exceptionally smart strategy calls and supreme driving performances to secure impressive finishes last weekend in California. 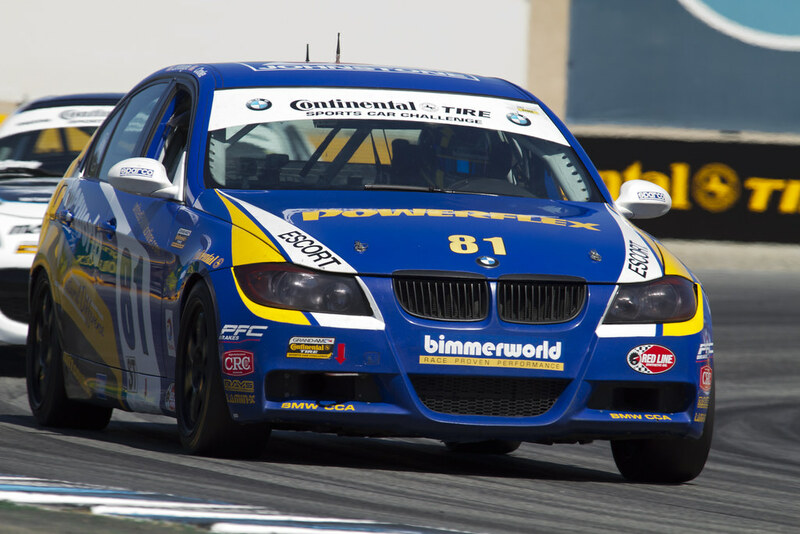 As routine winners in the series, BimmerWorld was prepared for the “race within a race” among normal-sized Street Tuner entries in Monterey, and turned to class-leading pit stops and tactics to propel the Nos. 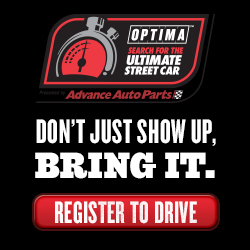 81 and 82 entries to fifth- and sixth-place finishes. 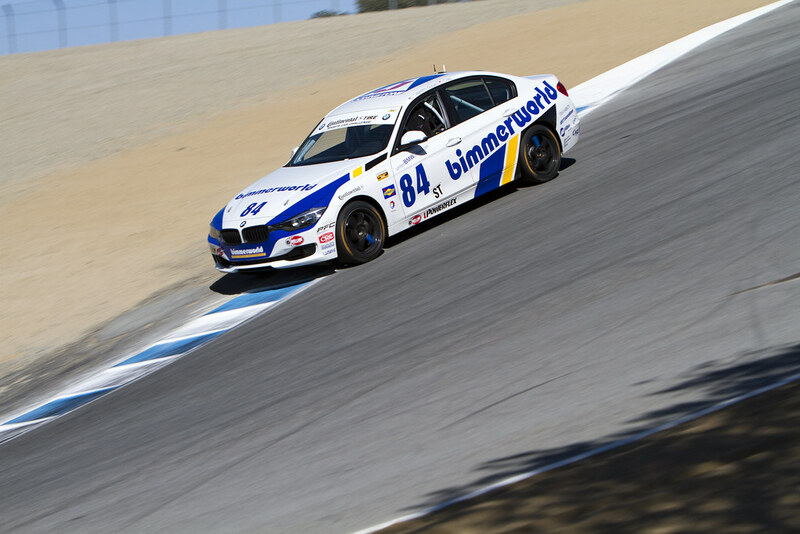 BimmerWorld’s Greg Liefooghe and Tyler Cooke battled for the top spot behind the trio of MX-5s that ran away in a 1-2-3 finish, settling for fifth in the No. 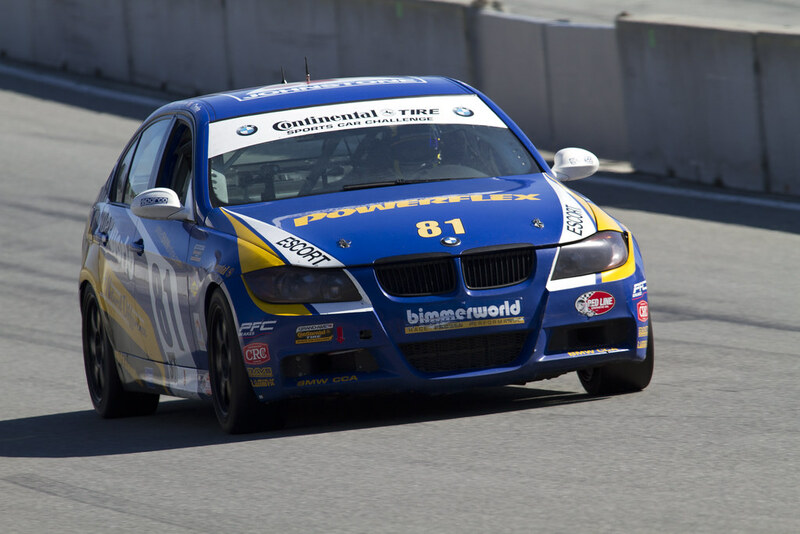 81 BimmerWorld BMW 328i after two hours and thirty minutes of frenetic competition. The finish also added to their points tally after three rounds, with the two sitting second in the Championship standings. 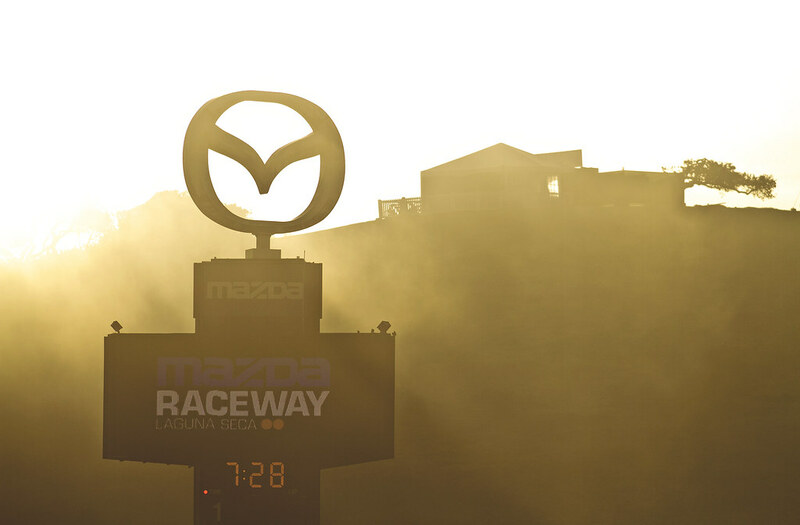 “When we looked at the calendar at the start of the year, we knew that, with the number of MX5s in the field, there were some tracks where we’d have no chance at a win,” said Liefooghe. “We focused on scoring as many points as possible for the championship and I think we achieved that goal. 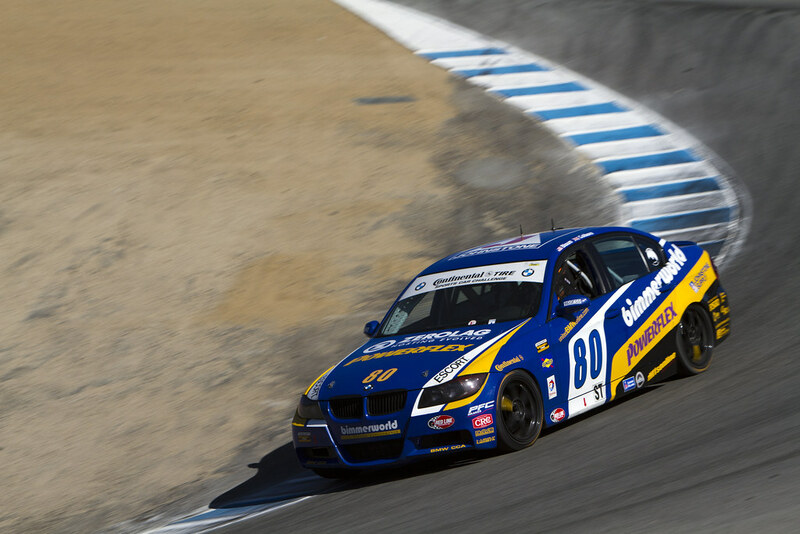 The Monterey race marked the latest outing for BimmerWorld’s brand-new turbocharged BMW F30 chassis, which is being developed in competition this year by Clay and teammate Jason Briedis. 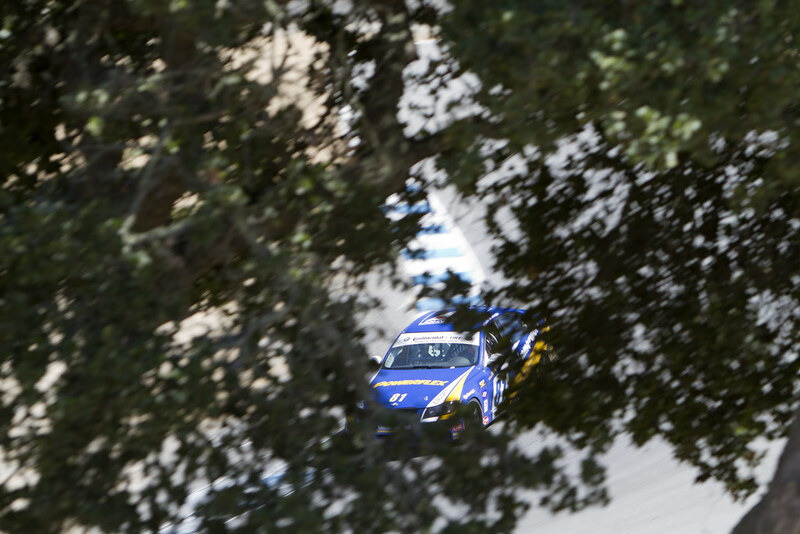 Based on its pace in California, Clay sees better finishes on the immediate horizon. 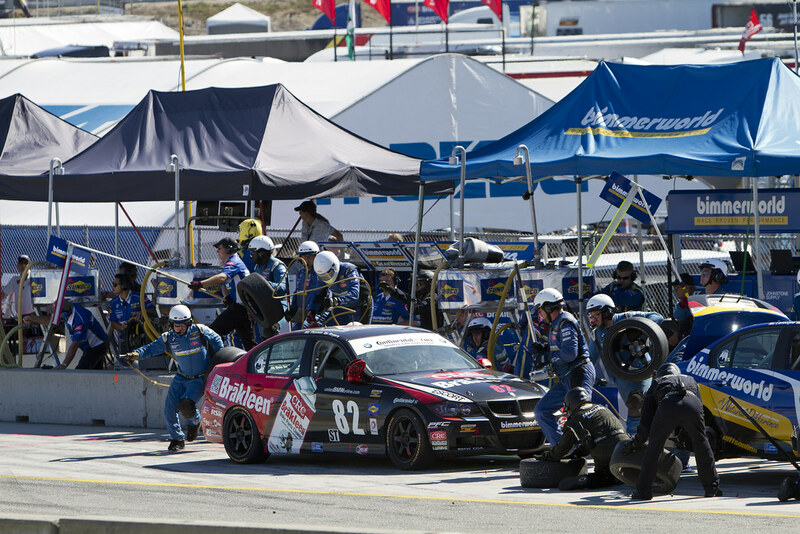 Faced with a mid-March race at Sebring International Raceway that didn’t go according to plan, the BMW experts at BimmerWorld have taken the better part of six weeks to make sure this weekend’s Continental Tire Series race in Northern California follows their desired script. 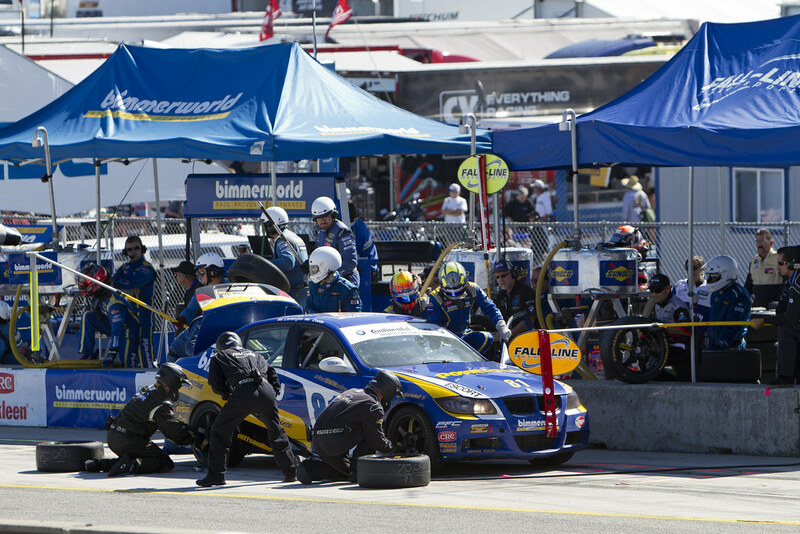 Sebring’s bumpy, punishing circuit highlighted areas for the Dublin, Virginia-based team to improve with its damper package, among other items, which led to a thorough analysis of BimmerWorld’s performance data and track testing leading up to Saturday’s race at Laguna Seca. 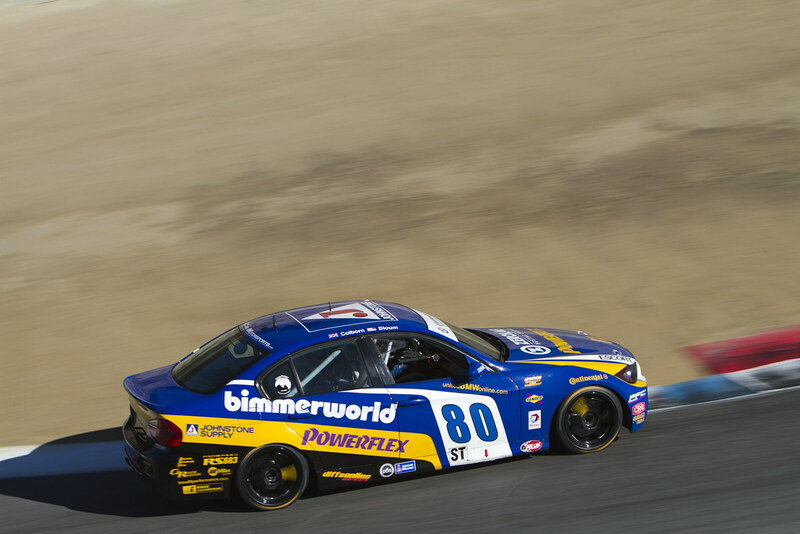 The lighter, smaller 2-door cars within the Street Tuner class have recently dominated the Monterey event, which creates an issue for normal-sized 4-door sedans, but based on what he’s seen from their gains, Clay expects to see a stronger challenge posed by BimmerWorld’s four-car BMW effort. 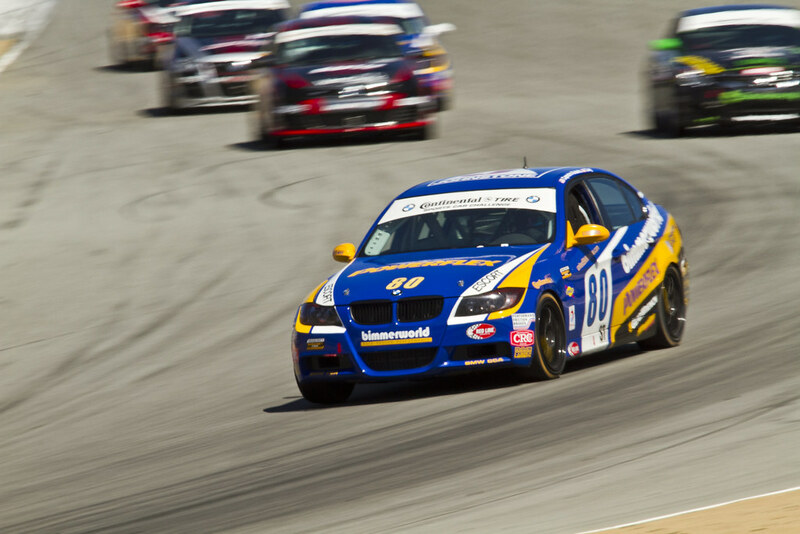 In addition to BimmerWorld’s highly developed BMW E90 platform, the team has also undertaken the major task of turning BMW’s turbocharged F30 chassis into a serious competitor in the Continental Tire Series’ Street Tuner class. 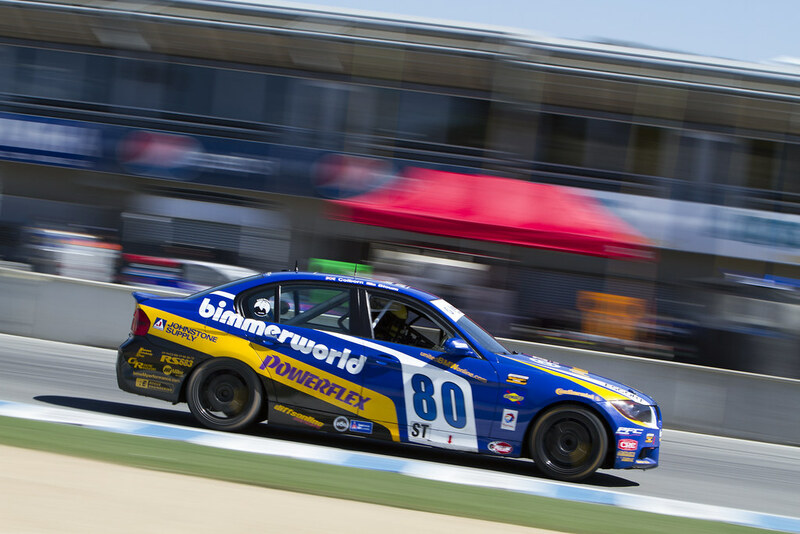 With advances being made every day by BimmerWorld’s team of engineers and technicians, Clay expects the F30 to unleash more of its potential this weekend. 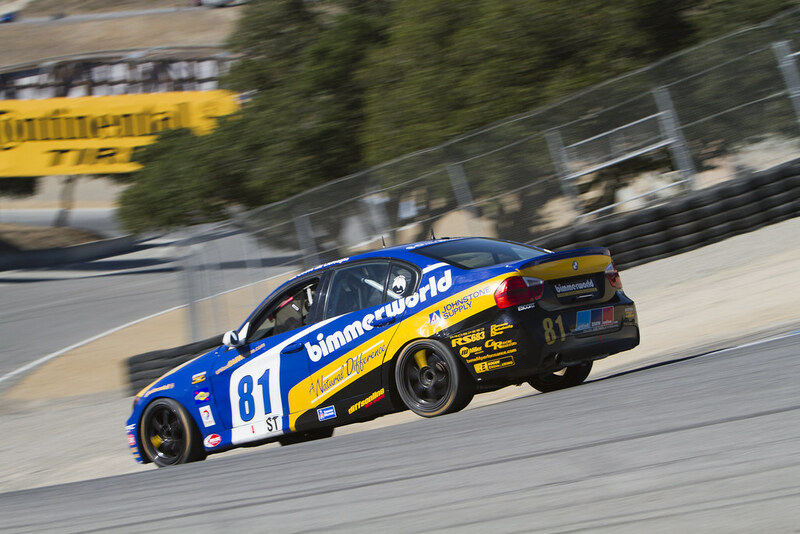 With one round to go before the season finale, BimmerWorld Racing needed to maximize its results last weekend in Monterey, and with a pair of top-10s for its Grand-Am Continental Tire Series Street Tuner Championship contenders, the Virginia-based BMW experts scored more valuable points in their quest for the 2013 Drivers’, Teams’ and Manufacturers’ titles. The No. 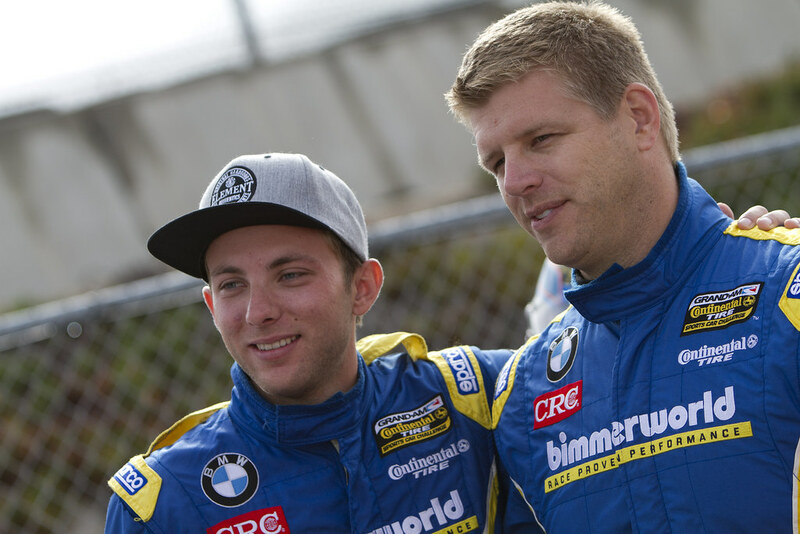 81 duo of Gregory Liefooghe and Tyler Cooke improved their position to third in the standings after claiming fourth at Monterey, and Dan Rogers and Seth Thomas moved into a tie for fourth in points after securing a seventh-place result, giving BimmerWorld team owner/driver James Clay a cause for optimism as the team prepares for the Championship decider at Lime Rock. 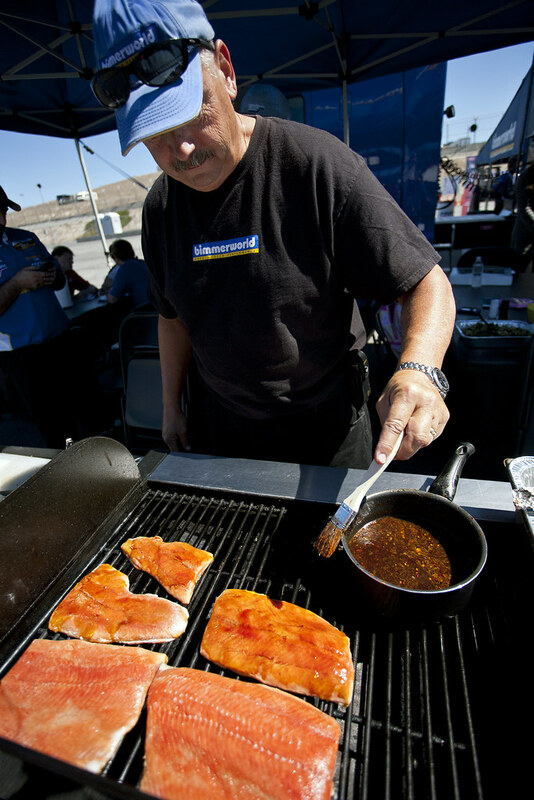 With two cars in contention for the Drivers’ and Teams’ Championships, Clay knows that despite the solid results for the No. 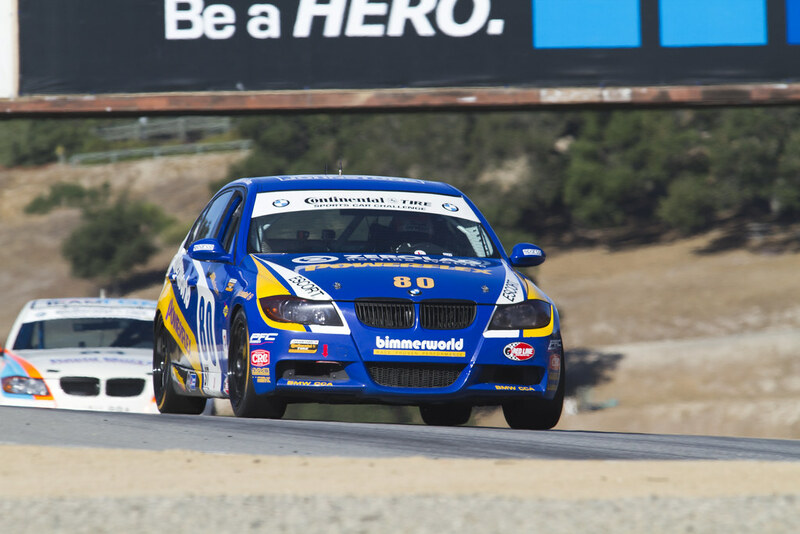 81 and 82, anything other than a win by one car and a second-place by the other at Monterey would leave BimmerWorld with a significant points gap to overcome at the title-deciding round. 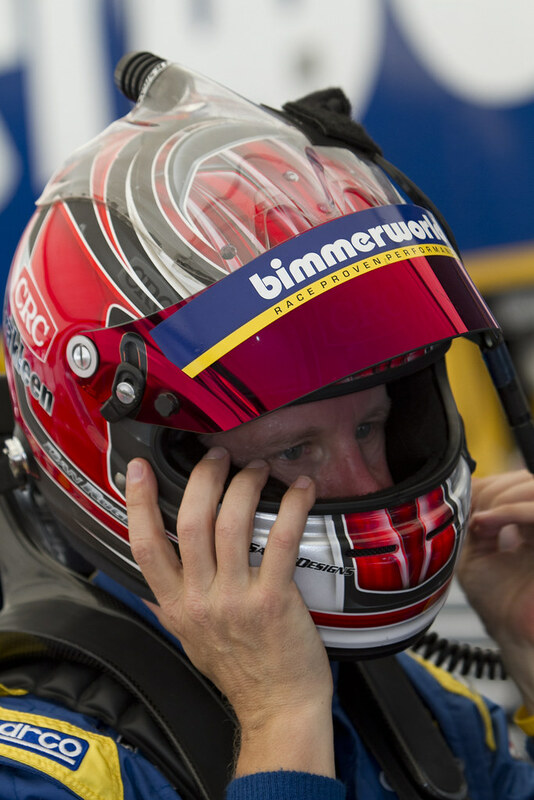 “We’re at crunch time in the Championship and we’re not in the lead, so other than continuing to give our best effort, we’d have to benefit from some of our rivals having bad days at Lime Rock to feel more confident about coming out on top, and that’s not what any team wants to wish for,” he continued. 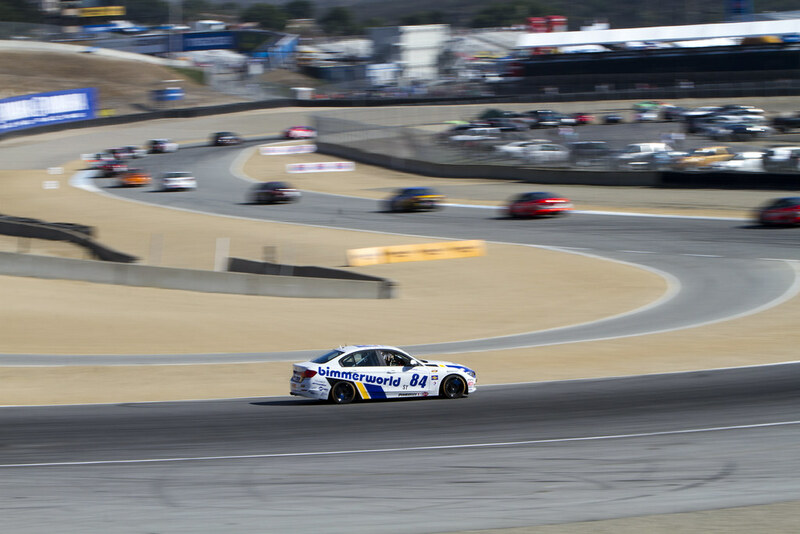 For Liefooghe, who has become one of the breakout starts of the Continental Tire Series, taking a fighting fourth around the 2.2-mile California road course was a bittersweet finish after coming close to cracking the top-3. The sister No. 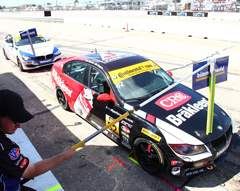 82 CRC BRAKLEEN® BMW of Dan Rogers and Seth Thomas, as Thomas describes, struggled to find the same balance as the No. 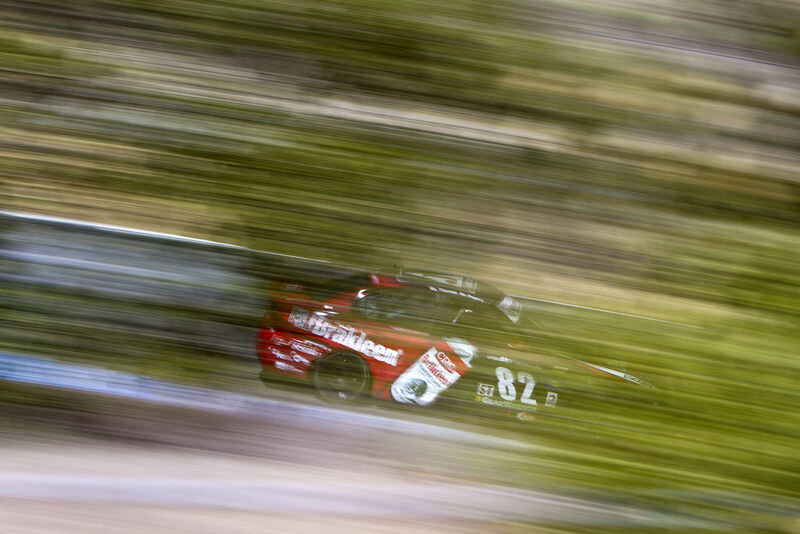 81, yet nearly finished in Liefooghe’s wheel tracks before settling for seventh. 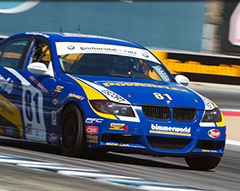 The third BMW E90 entry from BimmerWorld, the No. 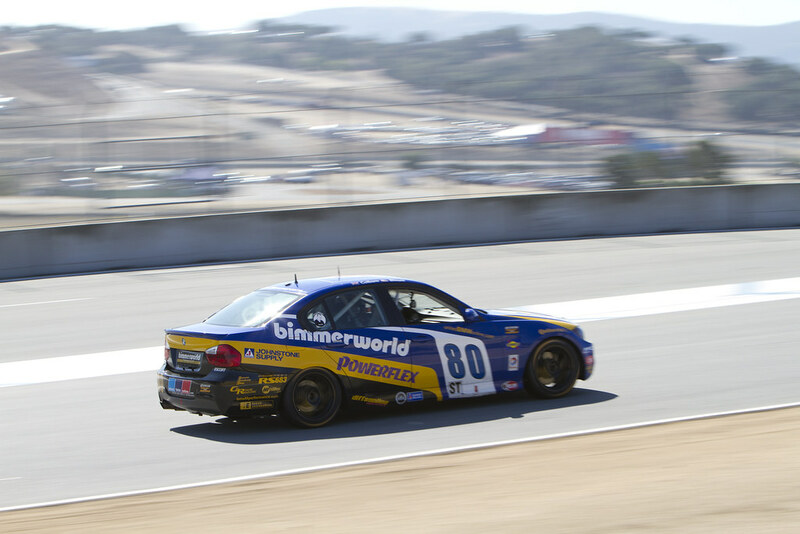 80 piloted by Connor Bloum and James Colborn, finished an unrepresentative 18th at Monterey, while the promising new No. 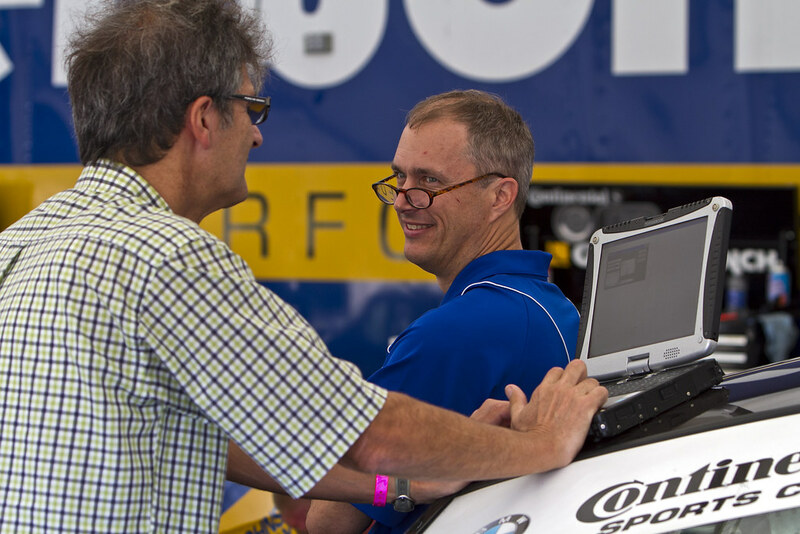 84 F30 chassis driven by Clay and John Capestro-Dubets logged more data as the team tests the car during the final races in 2013 for its full-fledged debut in 2014. 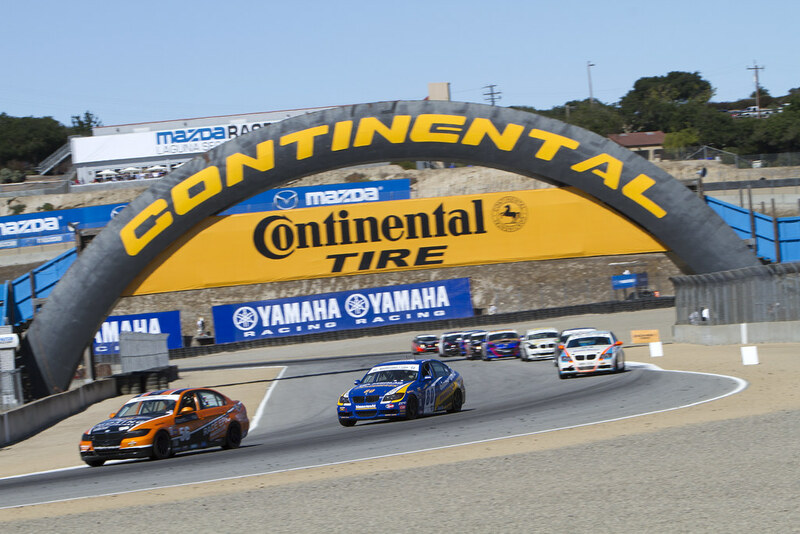 Catch the Monterey Continental Tire Series broadcast on Saturday, September 15, at 4 p.m. 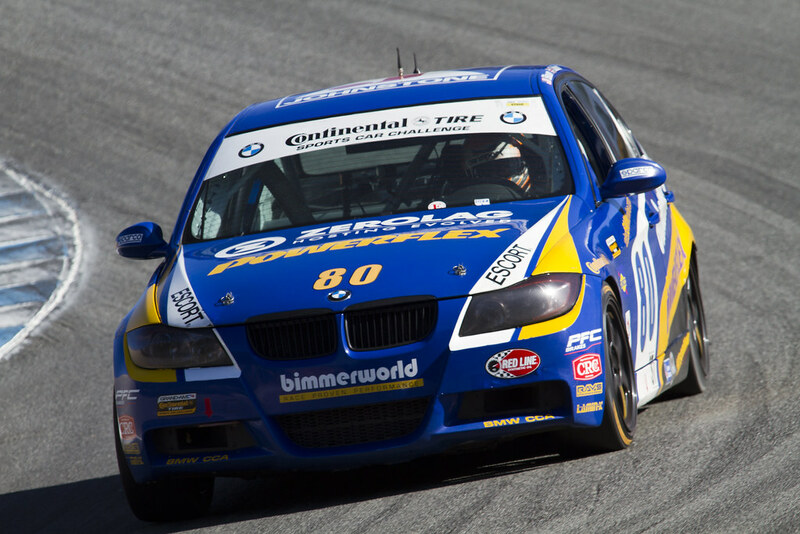 ET, and be sure to follow the BimmerWorld team as they prepare for Lime Rock at www.BimmerWorldRacing.com. 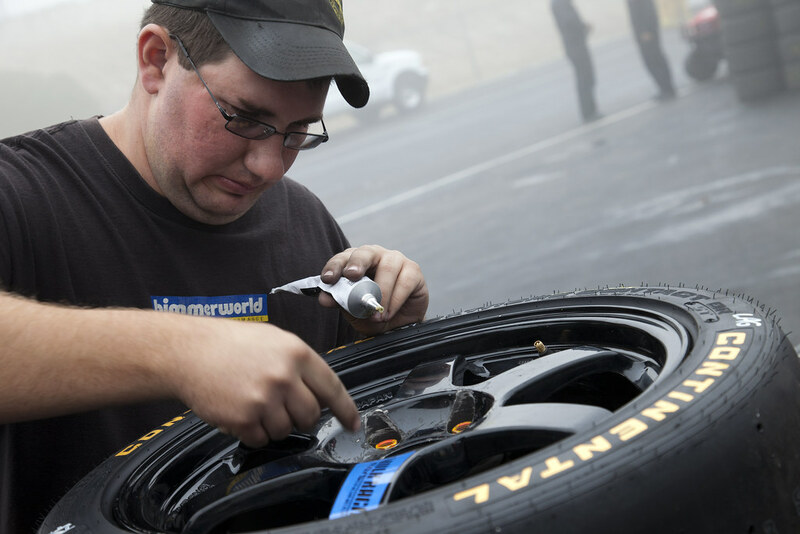 The Virginia-based BMW aftermarket and tuning experts at BimmerWorld are drawing near to the close of their fourth season in GRAND-AM’s Continental Tire Series, and once again find themselves in the thick of a Championship battle in the Street Tuner class. 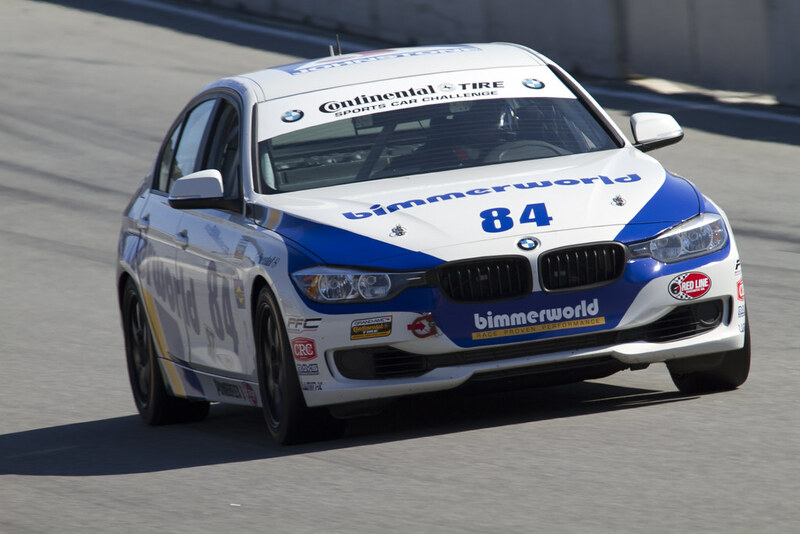 With three BMW 328is forming the core of BimmerWorld’s effort, wins and consistency from two of those entries has the team tied for fourth in the standings with the No. 81 car driven by Gregory Liefooghe and Tyler Cooke and the No. 82 No. 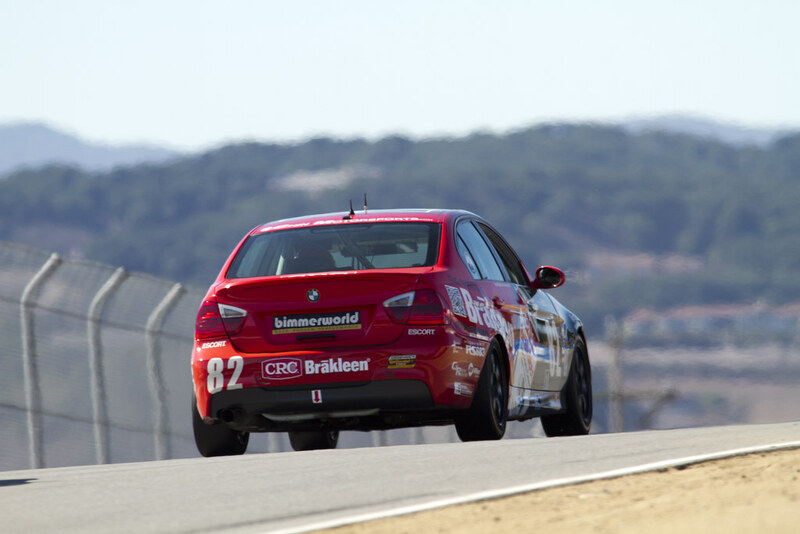 82 CRC BRAKLEEN® BMW piloted by Seth Thomas and Dan Rogers. Moving the Nos. 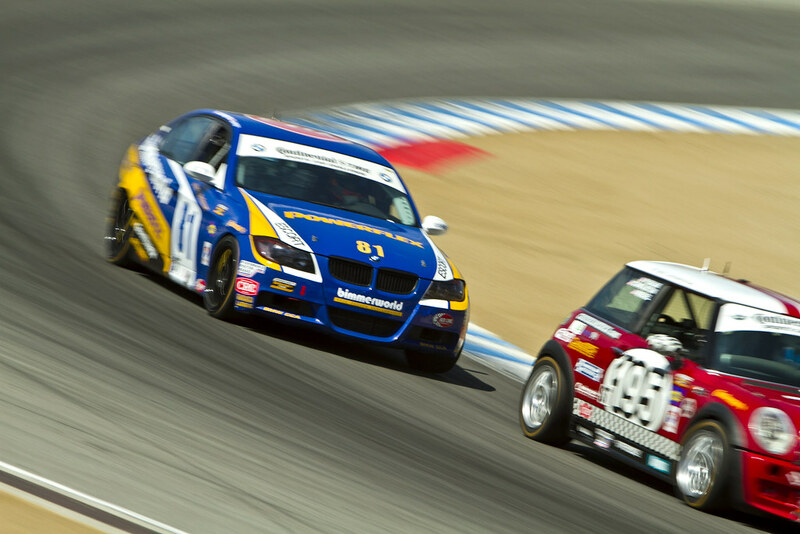 81 and 82 further up in the standings during this weekend’s penultimate round at Mazda Raceway Laguna Seca is the primary goal for the program, and adding to that challenge is the rules-based disparity between BimmerWorld’s normal-sized four-door BMW sedans and the smaller, lighter ST cars that have been advantaged throughout most of the season. 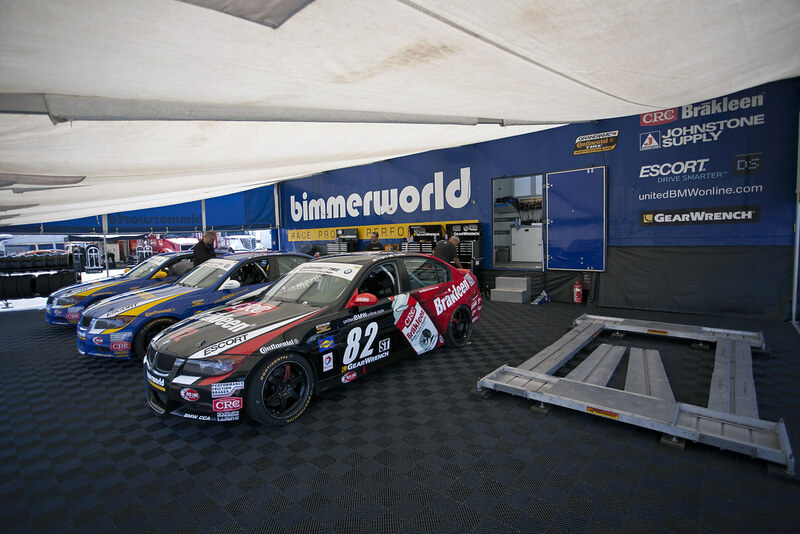 Despite having to work harder for quality results, BimmerWorld’s mechanics, engineers and drivers have put the team on the Championship trail once again, which has made team owner/driver James Clay especially proud. 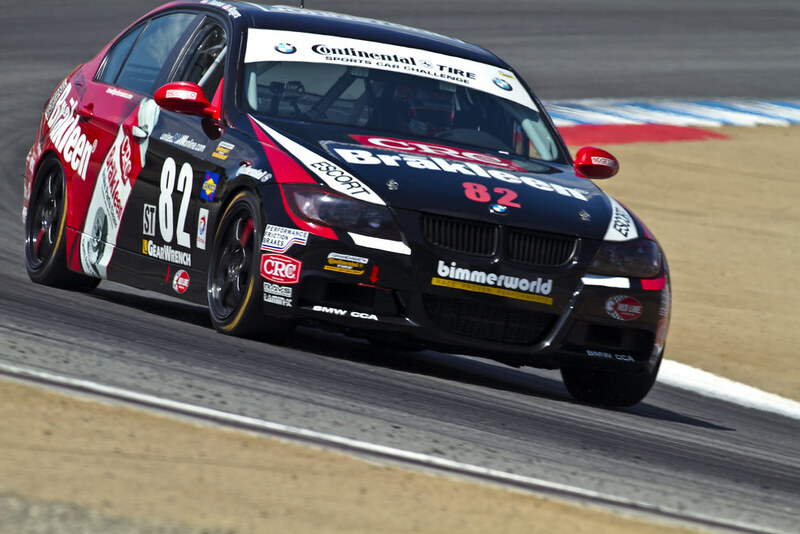 “2013 has shaped up to be another strong year for BimmerWorld Racing with another shot at the Championship,” he said. 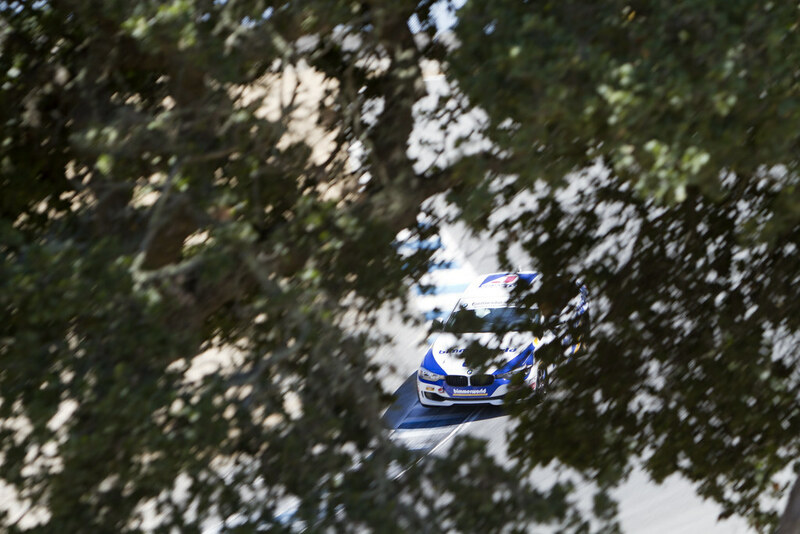 “I am not sure the BMW cars we race are always the best with the rules balance, but BMW builds a solid, consistent, and reliable car, and that is the DNA required to be in this Championship position on a consistent basis. 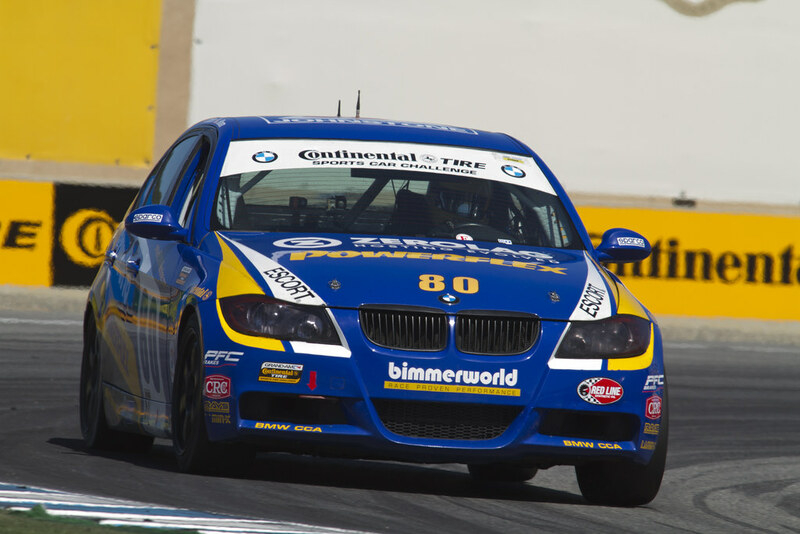 BimmerWorld came close to winning the ST Championship on its first try in 2010, earning a statistical tie for first place, and after splitting its program to run in the Grand Sport class as well as ST in 2011,they’ve been in the title hunt since focusing entirely on ST since 2012. 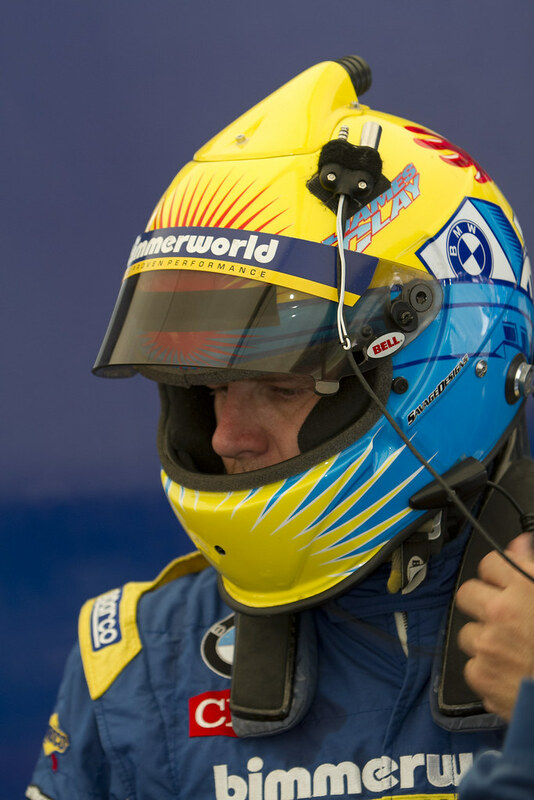 Turning the team into a regular Championship contender with new and different drivers in the cockpit has also been one of BimmerWorld’s greatest success stories, which Clay reflected upon ahead of Monterey. 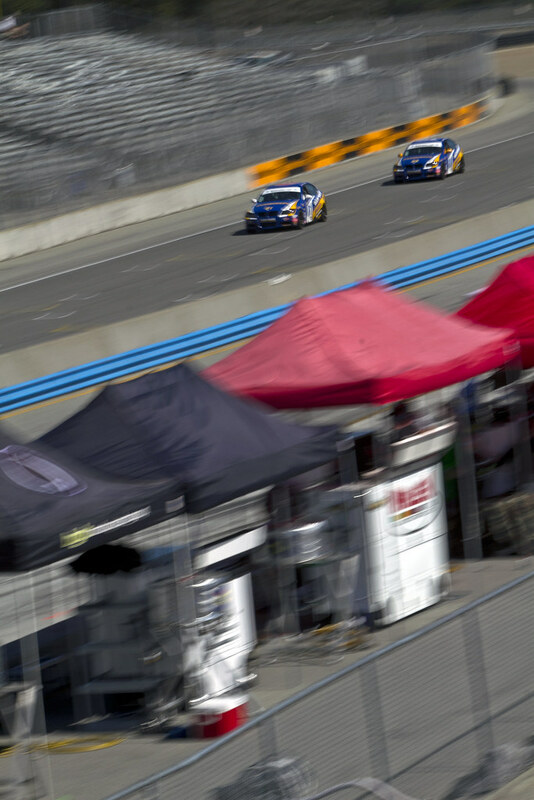 The trip to California’s central coast is clearly important for the team, and questions regarding which approach should be taken—an aggressive one to try and capture points with hard driving, or one where pit strategy plays a significant role in advancing the cars—has led the BimmerWorld team in a fairly conclusive and simplified direction. 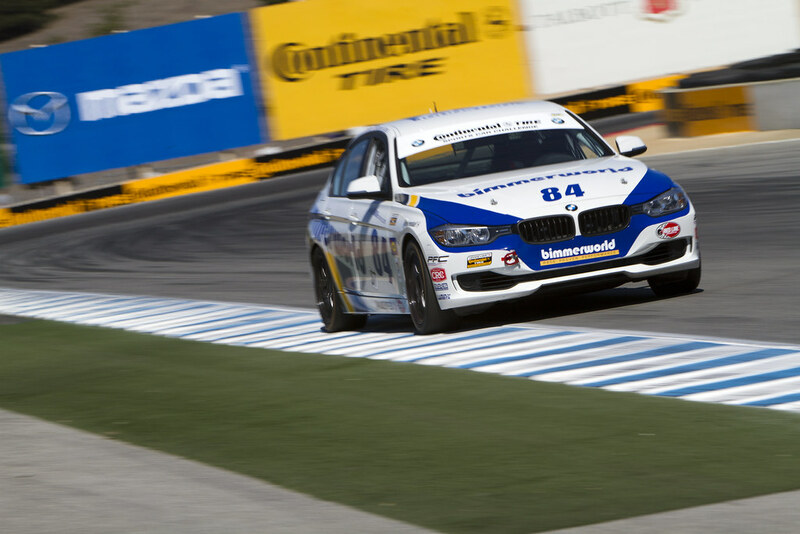 Coming off an historic win at the Indianapolis Motor Speedway, placing one car on the podium at Monterey, another in sixth and the final member of the BMW 328i trio in 11th might not sound like something to crow about, but the ninth round of the GRAND-AM Continental Tire Series typified BimmerWorld’s remarkable season. 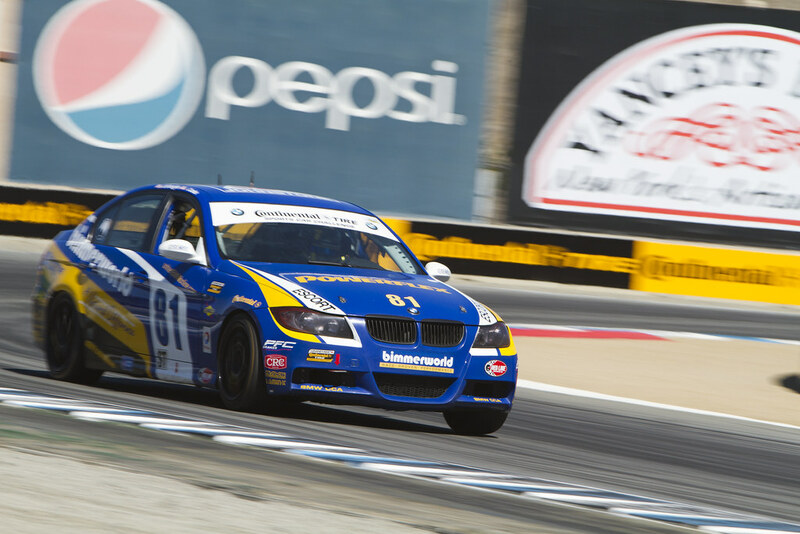 The BMW experts were fast, fought for the win in the Street Tuner class, saw two of its drivers spray champagne during podium celebrations and all of its entries grabbed a handful of points in all three championship categories. 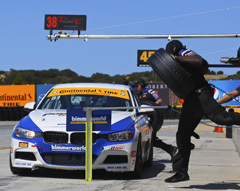 With two wins from nine races, eight podium visits, all of its drivers inside the top 10 in the Drivers’ Championship, all three of its cars in the top 10 in the teams’ standings and having played a significant role in moving BMW atop the Manufacturers’ Championship, BimmerWorld is closing out the 2012 season in machine-like form. 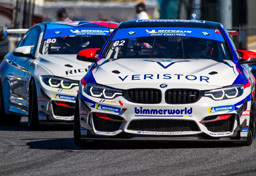 If winning every race isn’t possible, BimmerWorld’s formula of maximizing its total team performance each weekend when the victory is out of reach has clearly been paying off. 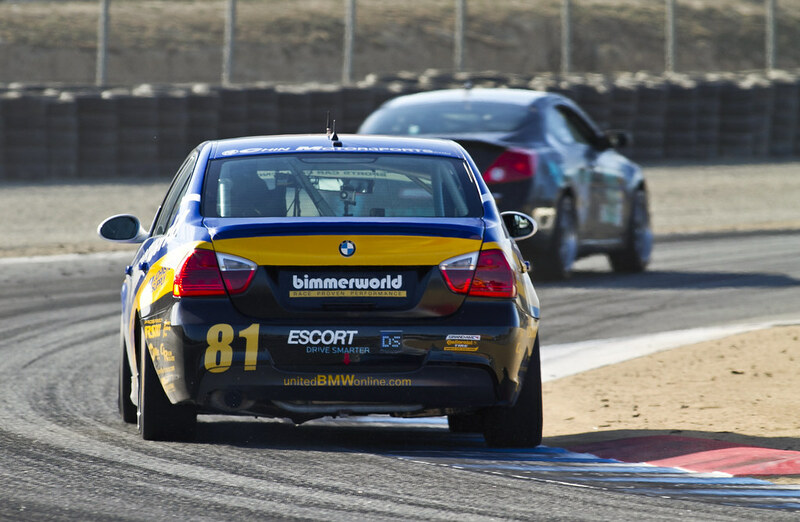 One year ago, BimmerWorld owner/driver James Clay had his team fielding a pair of BMWs in both the ST and the Grand Sport categories, but after shifting his program over to run three BimmerWorld-built 328i ST cars for 2012, the results—and his team’s status in the series—have continued to skyrocket. BimmerWorld has seen the Nos. 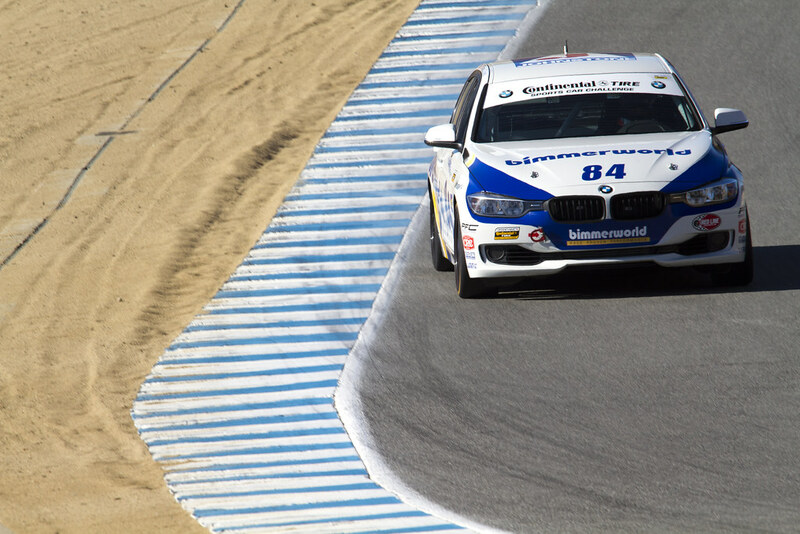 80, 81 and 82 328is surge at different points during the season, but the one constant between its fleet of BMWs has been paying points into the Manufacturers’ Championship. 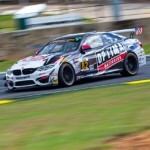 Although each of the BimmerWorld driver tandems hope to move up a few spots in the final Drivers’ Championship standings, cementing the title for BMW at the final race—held near the company’s New Jersey American base—is also a primary focus for Clay’s team. 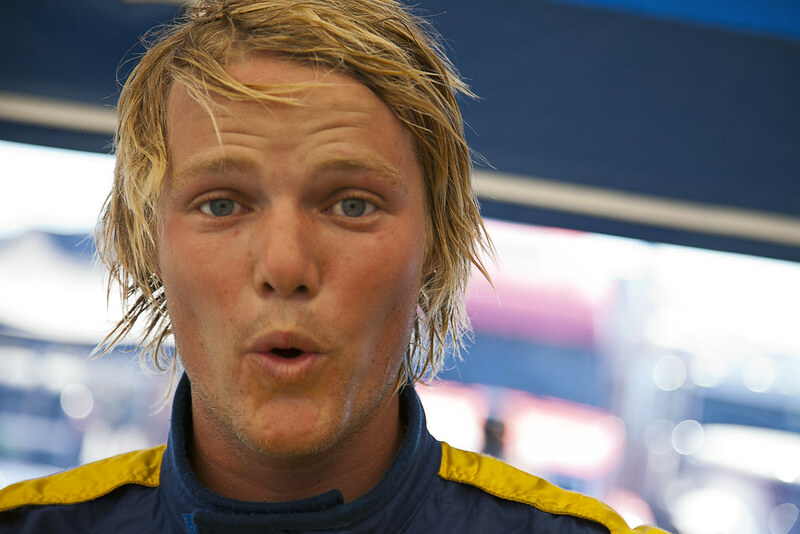 Looking at last weekend’s race, the performance of Liefooghe and Levine in the No. 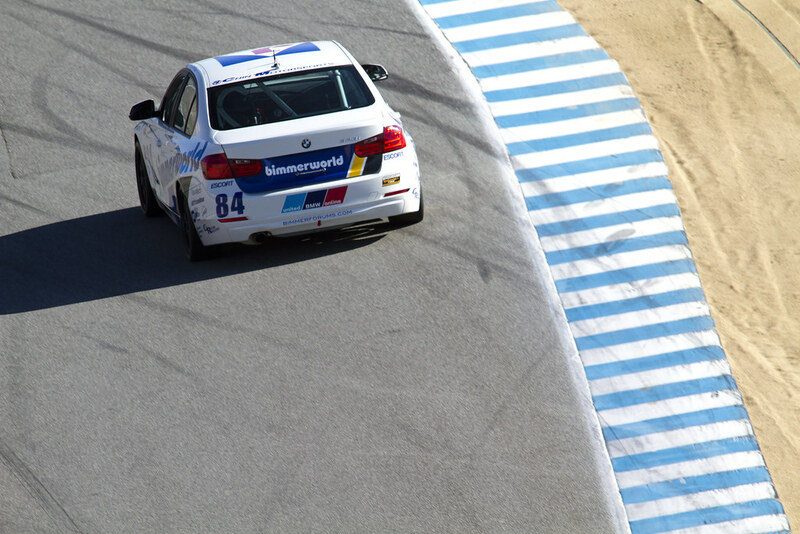 81 BimmerWorld BMW in Monterey was nothing short of spectacular. 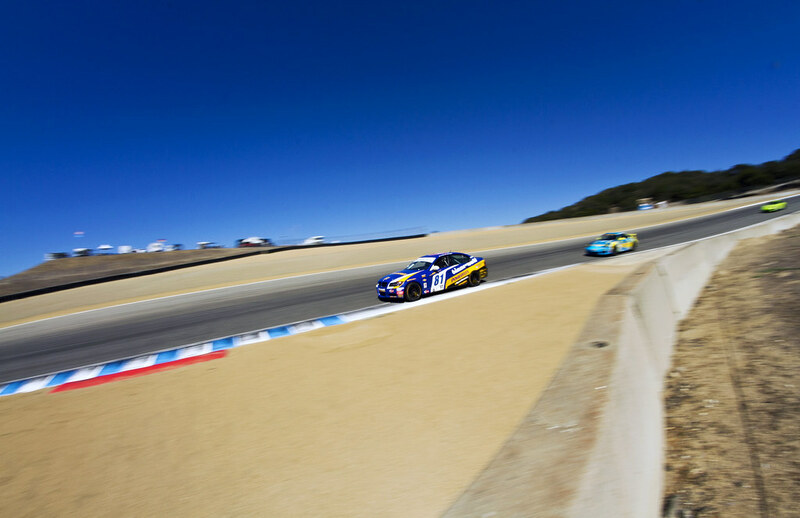 On a track where pint-sized ST cars thrive, the teammates carved their way from 13th to third on a day where contact was the norm. 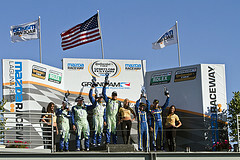 Clay and Capestro-Dubets entered Monterey riding a streak of three consecutive podium finishes, but settled for sixth in the No. 80. It marked the fifth time the duo has placed inside the top 6 this season. The highs experienced by the No. 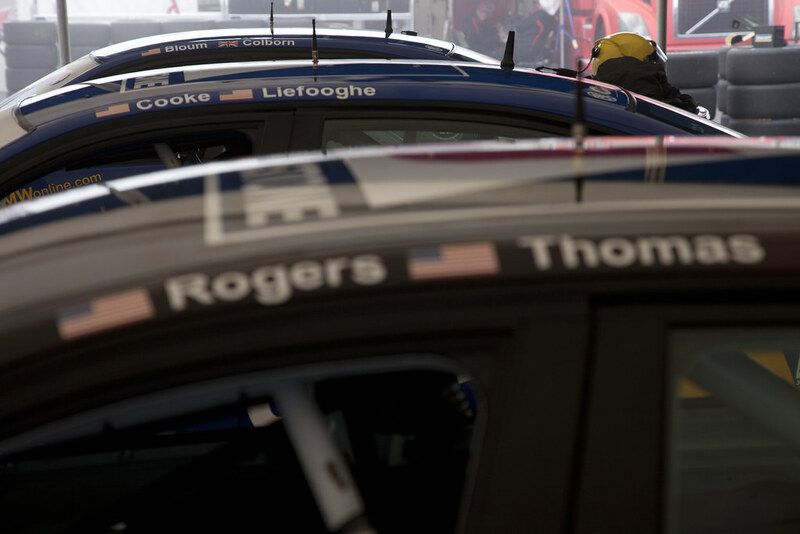 81 drivers were tempered by what Thomas and Rogers experienced in the No. 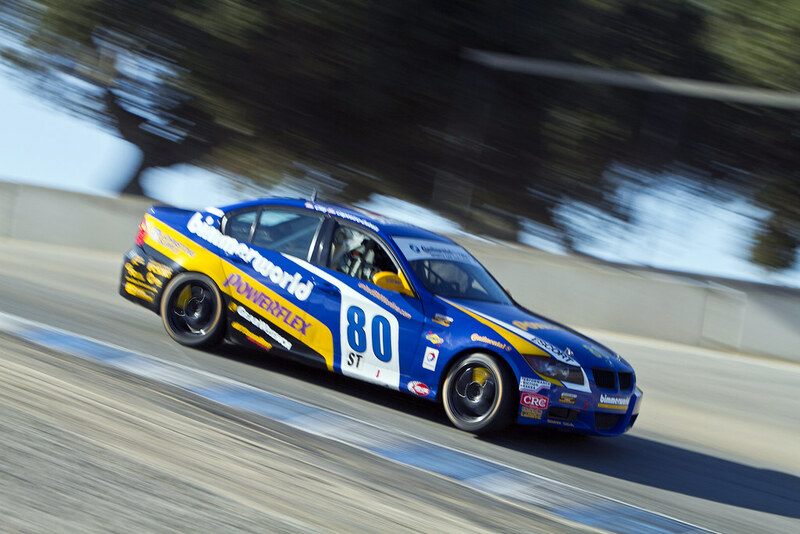 82 CRC BRAKLEEN® BMW 328i. 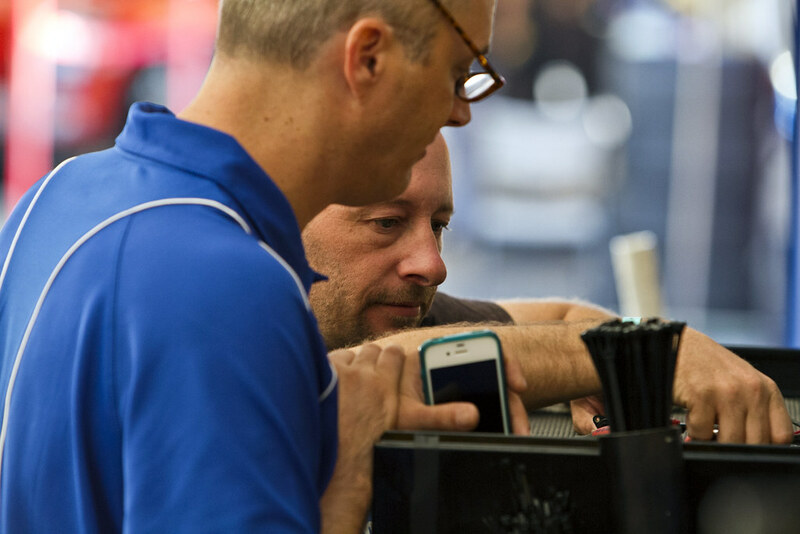 With guests from both CRC BRAKLEEN® and BMW SF looking on, the Indy winners had designs on back-to-back victories, but overly-ambitious driving by the competition slowed their progress. 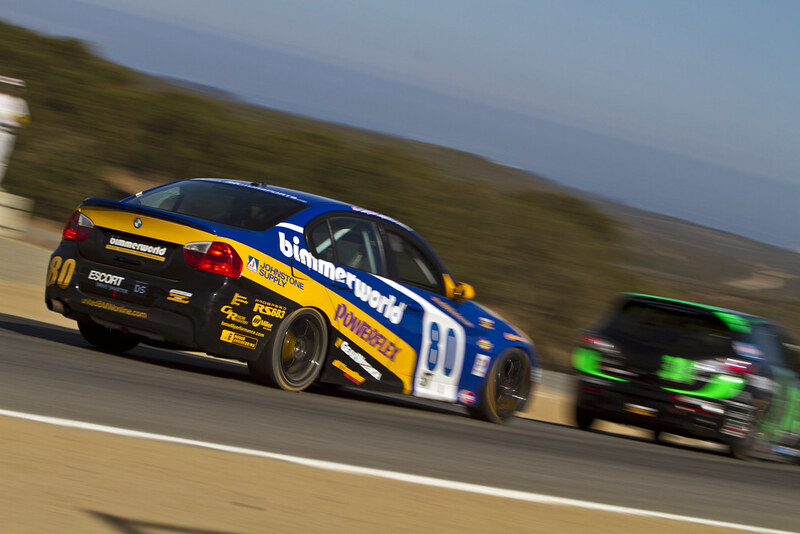 With the penultimate round behind them, BimmerWorld’s has one chapter left to write before its amazing season draws to a close. 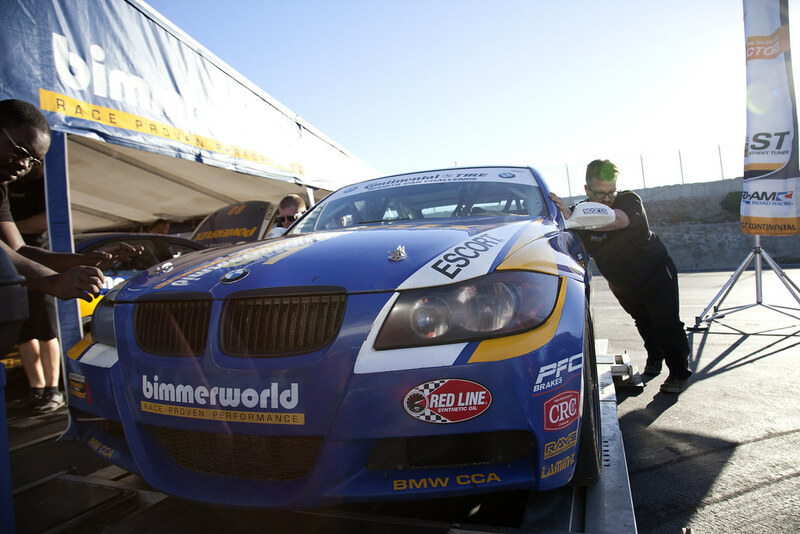 Follow the BimmerWorld team as they prepare for Lime Rock at www.BimmerWorldRacing.com and be sure to watch the Monterey race when it airs on SPEED September 16th at 1:30 p.m. ET. 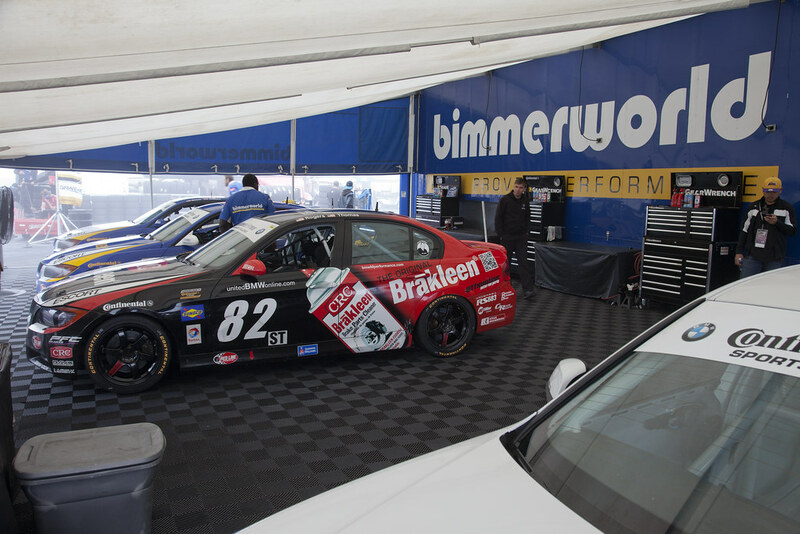 With more than a month since BimmerWorld made history by winning the first-ever GRAND-AM Continental Tire Series Street Tuner race held at the famed Indianapolis Motor Speedway, the BMW experts are back in business this weekend for a race on another famed circuit. 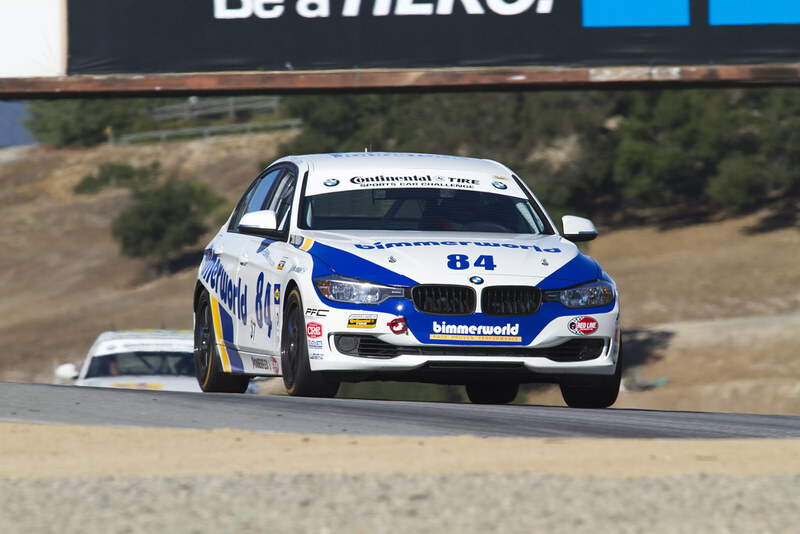 Making the trek from their base in Dublin, Virginia, BimmerWorld’s three-car BMW 328i team will unload its cars at Monterey Peninsula and take on the 11-turn, 2.2-mile Laguna Seca road course. 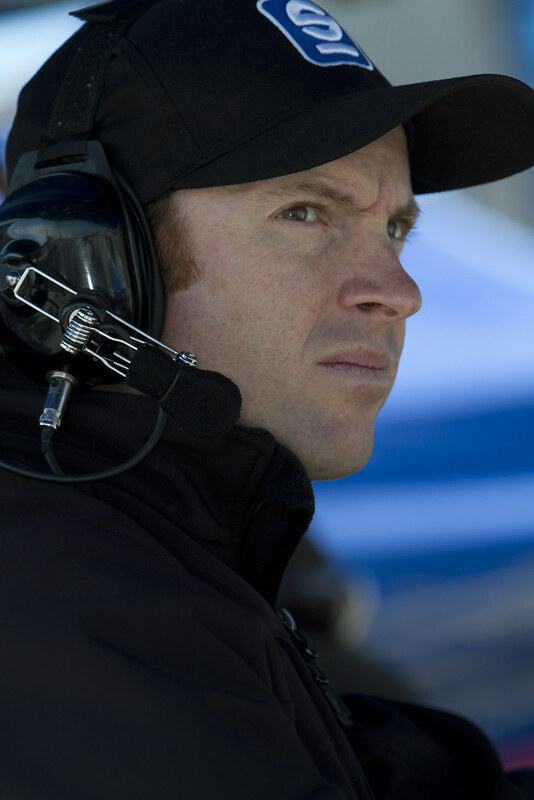 Team owner, James Clay, who shares the No. 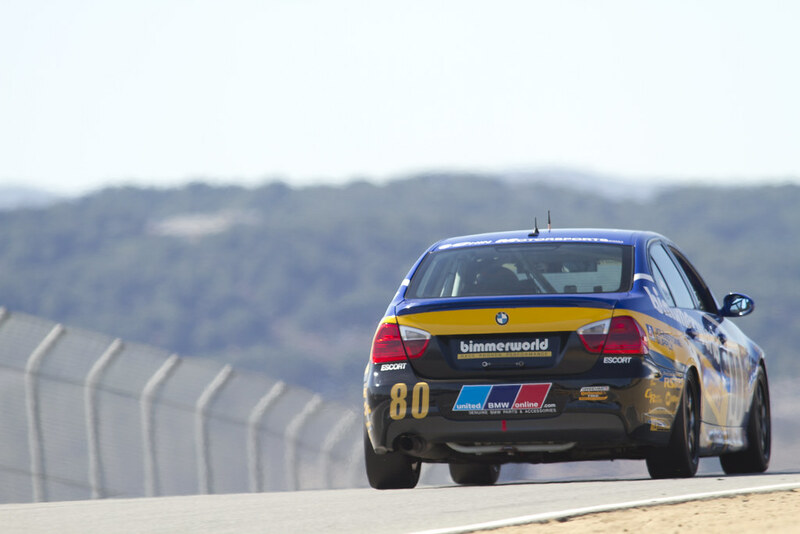 80 BimmerWorld 328i with co-driver, John Capestro-Dubets, says he’s reveled in the glorious result from Indy, but there’s been little in the way of idle time for everyone involved with the program. “Indy was an amazing weekend,” he remarked. 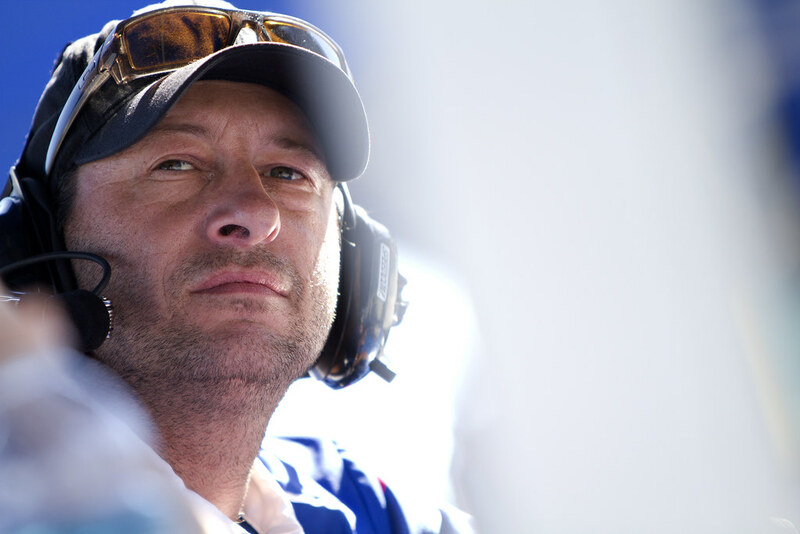 “Our team made some great strategy calls, the drivers kept up the hard work they have been putting in all season, and we had an awesome result. 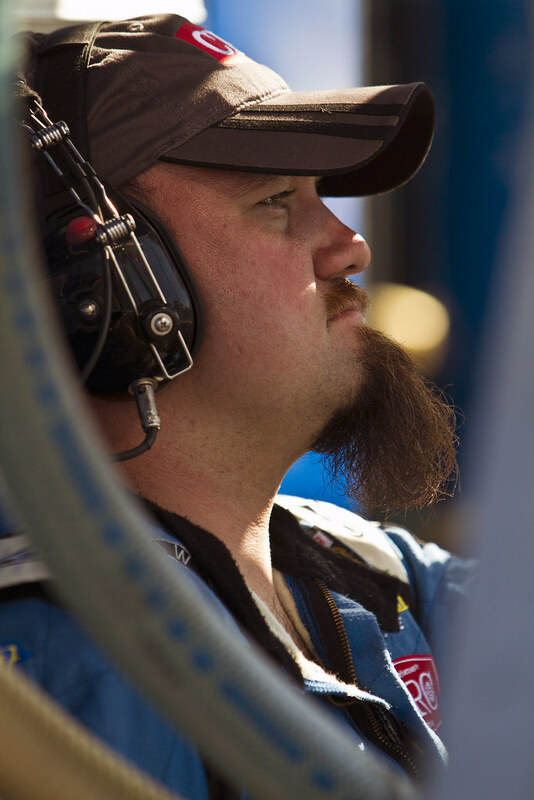 Finishing 1-2 is likely to be the high-point of this season, but just like when I am driving the car, I am keeping my eyes forward and looking toward the remaining two events and on to the full 2013 season. Clay and “JCD” followed their sister No. 82 BimmerWorld 328i across the finish line at Indy to fill two of the three spots on the podium, in addition to claiming the duo’s third consecutive visit to the podium. It also marked their fourth straight top 5 result, which makes continuing the late-season charge a priority this weekend for the No. 80. For Dan Rogers, half of the winning Indy combination with teammate Seth Thomas, getting his first professional win in the No. 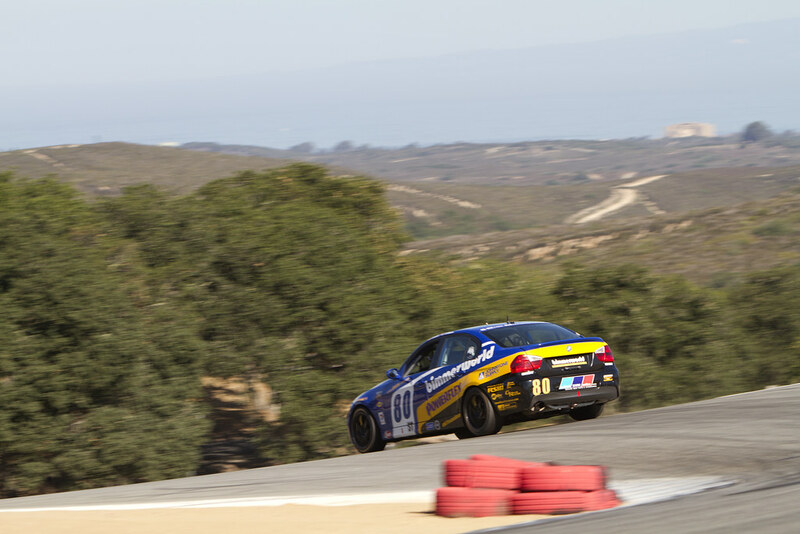 82 CRC BRAKLEEN® BMW 328i has made him hungry for more. 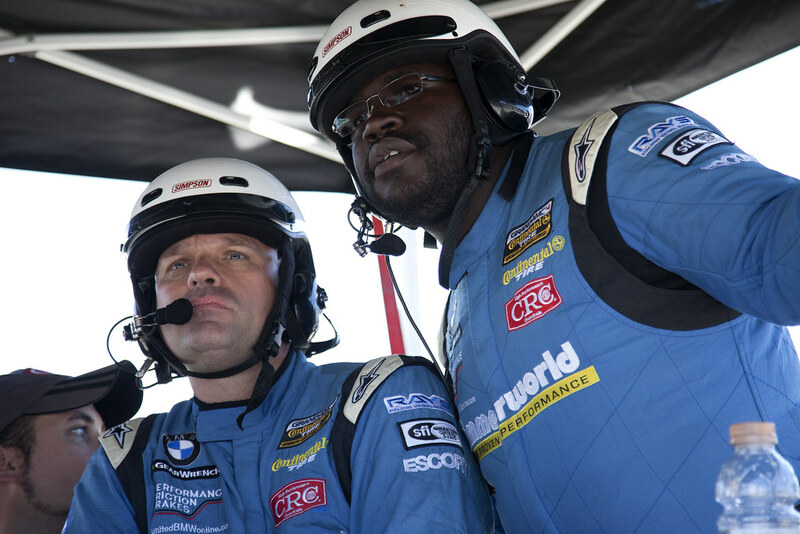 Gregory Liefooghe and co-driver David Levine nearly made it a BimmerWorld 1-2-3 at Indy, but fortunes did not favor the road racing ace and his rookie teammate. 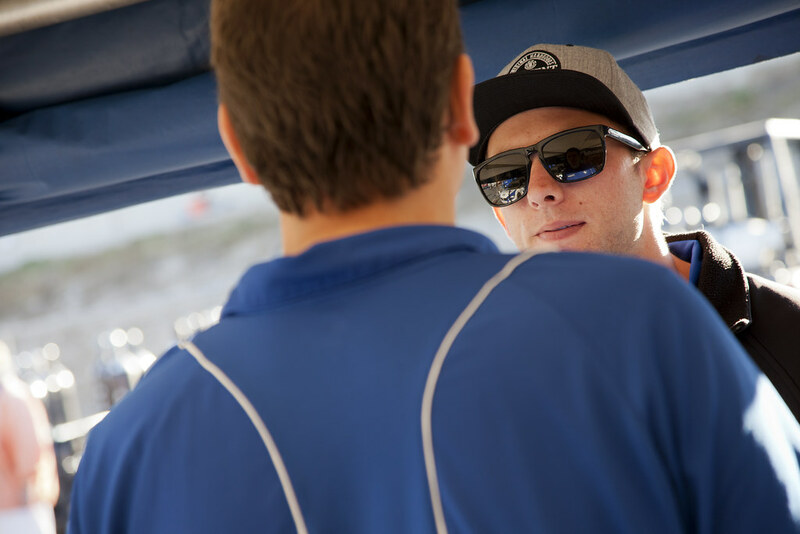 As a professional driving instructor and Bay Area resident, Liefooghe will be relying on his local knowledge to make up for Indy by taking the No. 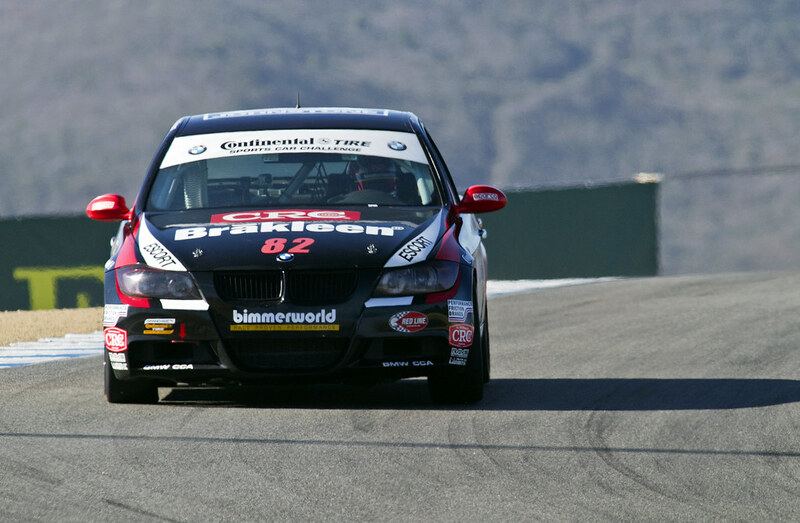 81 BimmerWorld 328i to the front of the field. 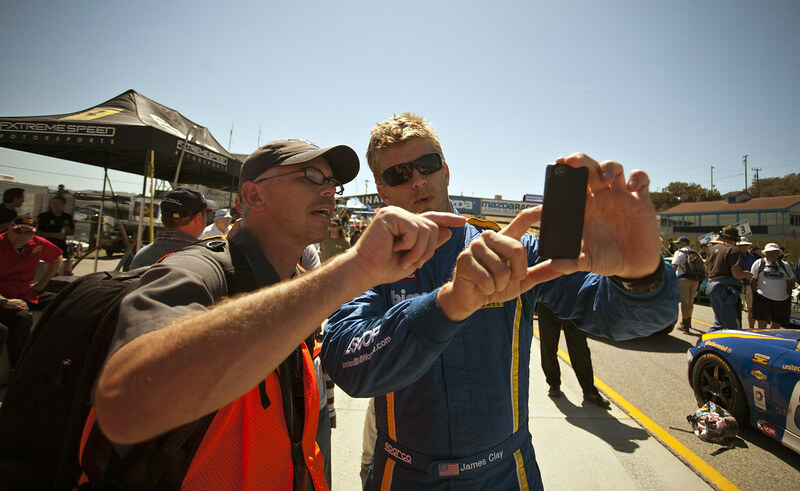 “I think the key to our rebound after missing out on a deserving finish at Indy will be our car,” he said. 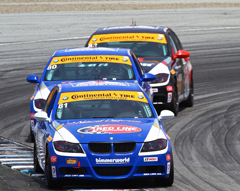 “BimmerWorld worked hard and brought some very fast cars at Indy. 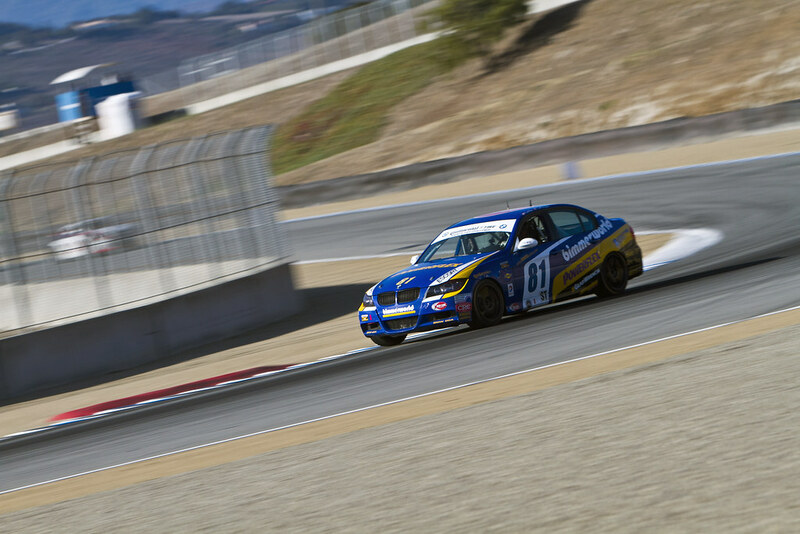 Even though we didn’t finish, we were running in third and looking for a podium finish when we had an issue.